In the beginning of February I had the opportunity of visiting Nachal Alexander with the school where I work. 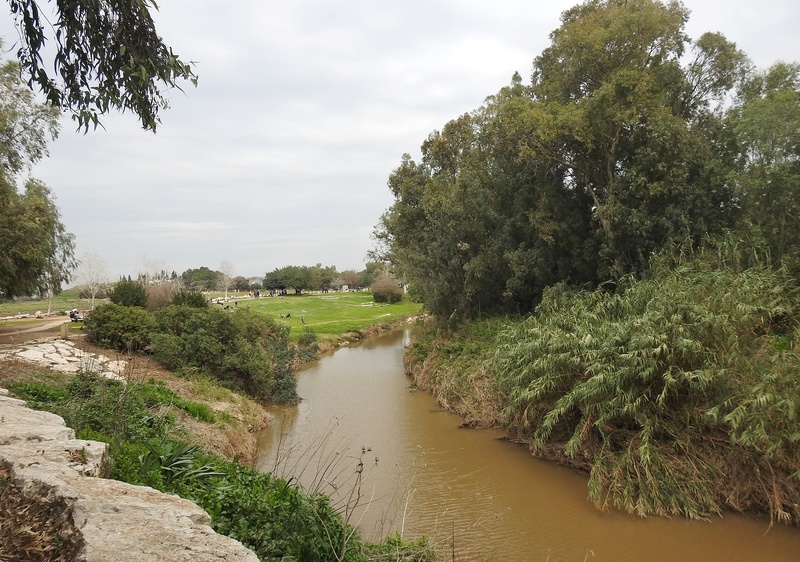 I had been to a select area of Nachal Alexander twice before, and have even written about it (linked above), but this time I was to be exploring the length the stream and thus a blog post is most warranted. 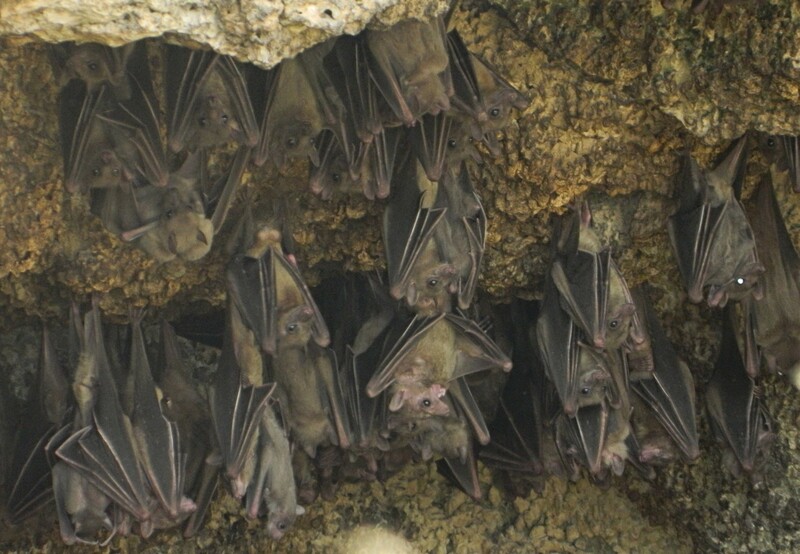 Being that it was a school trip, and that the school is a relatively large one with approximately 1,000 lads, the experience was going to be a bit different than ordinary, and I naturally anticipated seeing less wildlife. However, when the buses dropped us off near the mouth of the stream I could immediately see a handful of gulls as well as songbirds and knew it’d be interesting nonetheless. The educational staff and the lads lined the streambanks near where it reached the sea, and I took this opportunity to wander off a wee bit to see if I could find any waders. 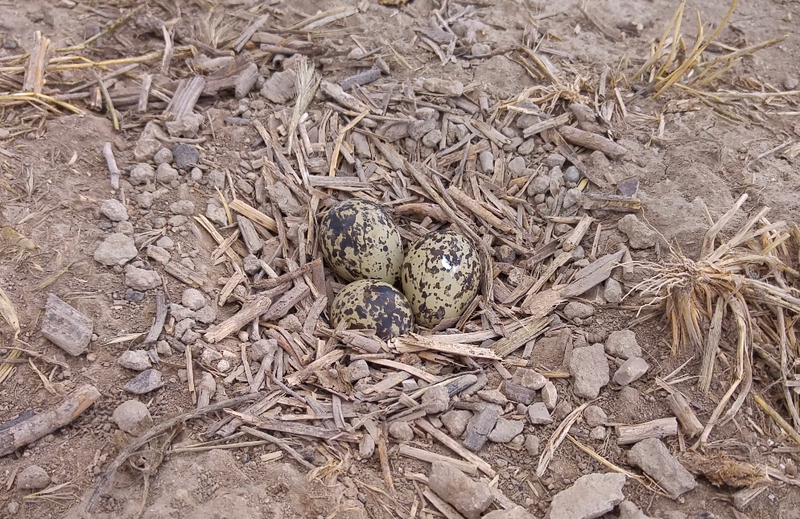 I did quite well, and found a greenshank, a common sandpiper, a little stint and a beautiful slender-billed gull standing on a ridge of washed-up seashells. 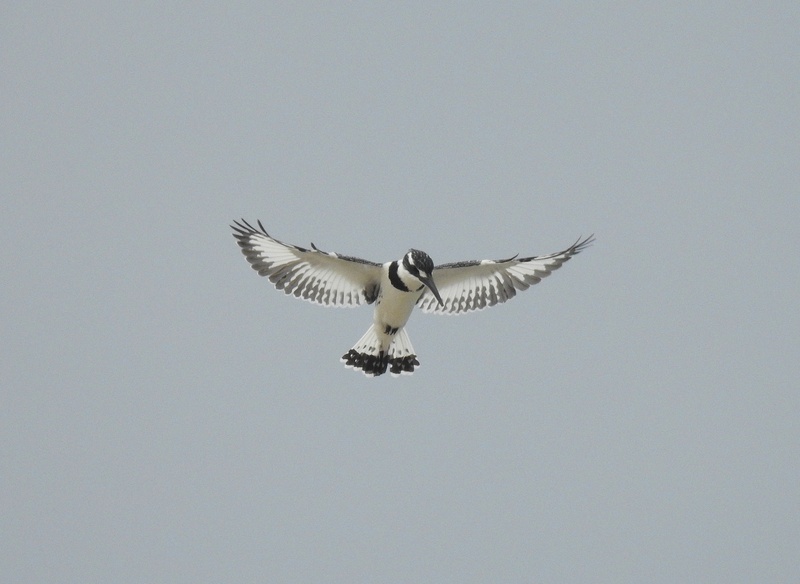 A few more birds and then it was off to the trail with a handful of straggling lads and other staff members. 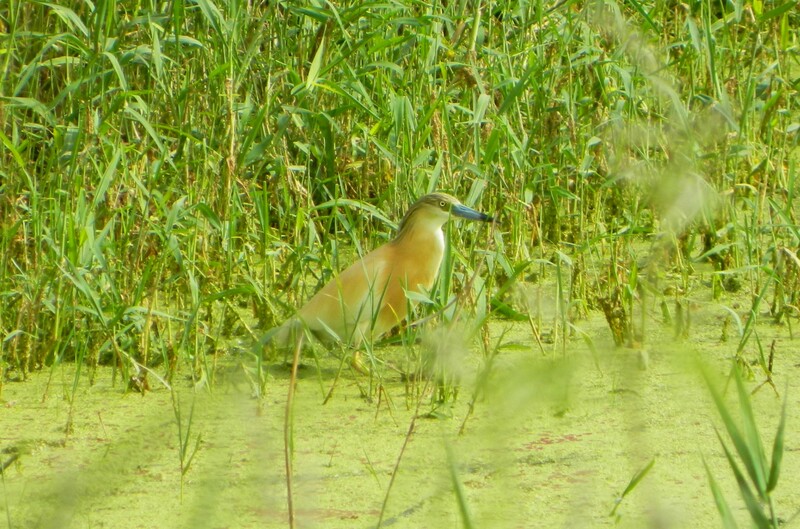 We walked alongside the stream and as soon as I had the opportunity to break free from the noises of the group I did, and was rewarded for my efforts by an interesting sighting. Two cattle egrets were prowling the trail ahead of me, and within minutes of each other, each of the caught poisonous centipedes and wolfed them down with great gusto. Dozens of greater cormorants came to view, some flying overhead and some in the stream’s languid waters, as well as a few moorhen. A brief break in a wooded area provided me sightings of a chiffchaff, black redstart and a reclusive-yet-noisy European robin. 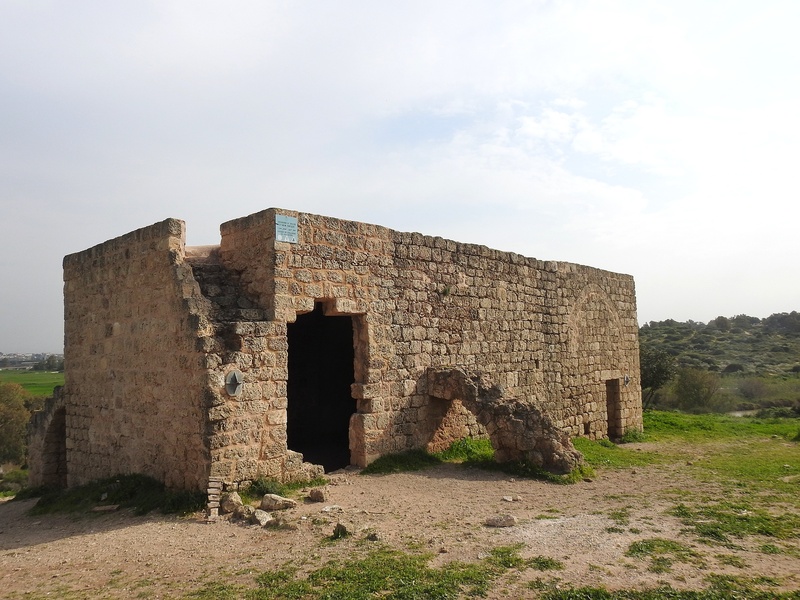 Before long I had reached the ruins of Khirbet Samara, a house built in the end of the 19th century by the Samara family of Tulkarem in order to oversee their watermelon fields in the nearby land. Climbing up the kurkar ridge to the ruins provided a closer look at the cut-stone house and its arched buttresses. Up top I was able to enjoy the view of the surrounding area, and of Nachal Alexander down below. Taking a set of stairs down the opposite side of the ridge brought me to a field of wildflowers, harbingers of spring. 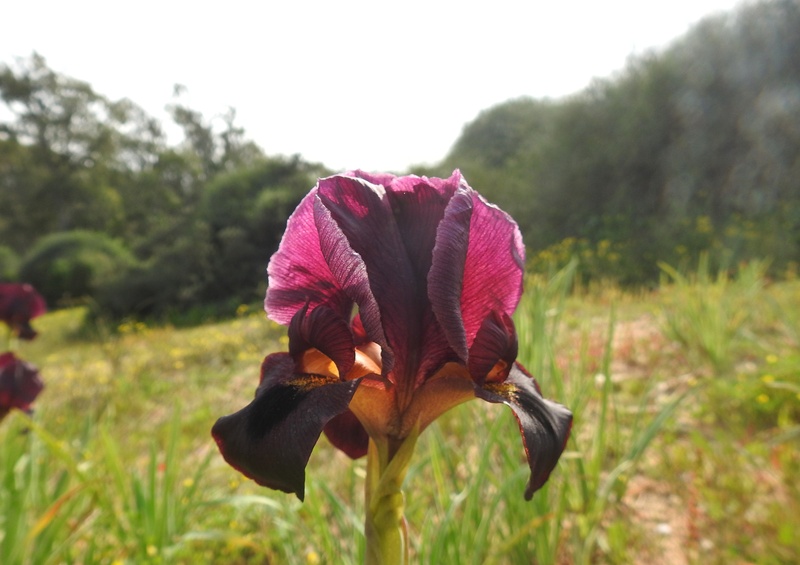 I was most excited to see clumps of coastal iris, a particularly dark flower that attracts photographers more than bees. I wanted to spend more time with the irises, as I find it particularly challenging to photograph wildflowers, but I knew that I was the very last one in our group and I had to catch up with the others. 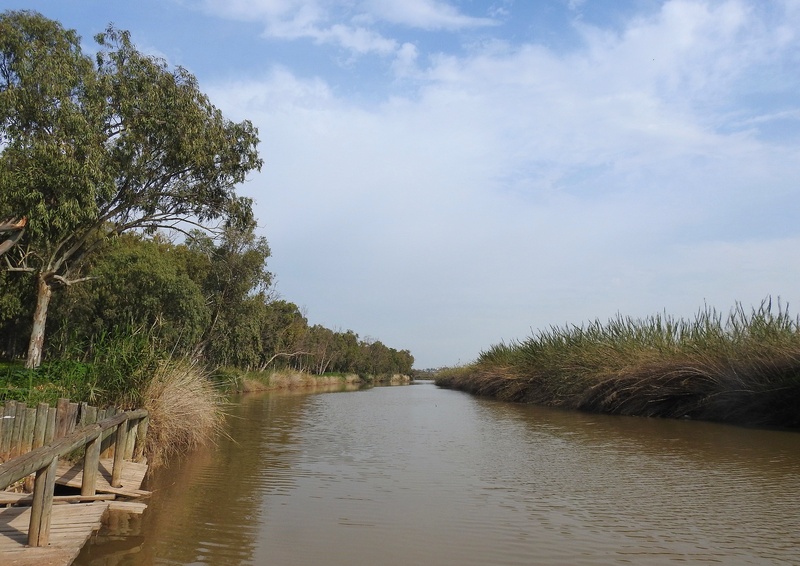 I continued along the stream, following the Israel National Trail as I encountered small flocks of cormorants perched high up on eucalyptus trees. 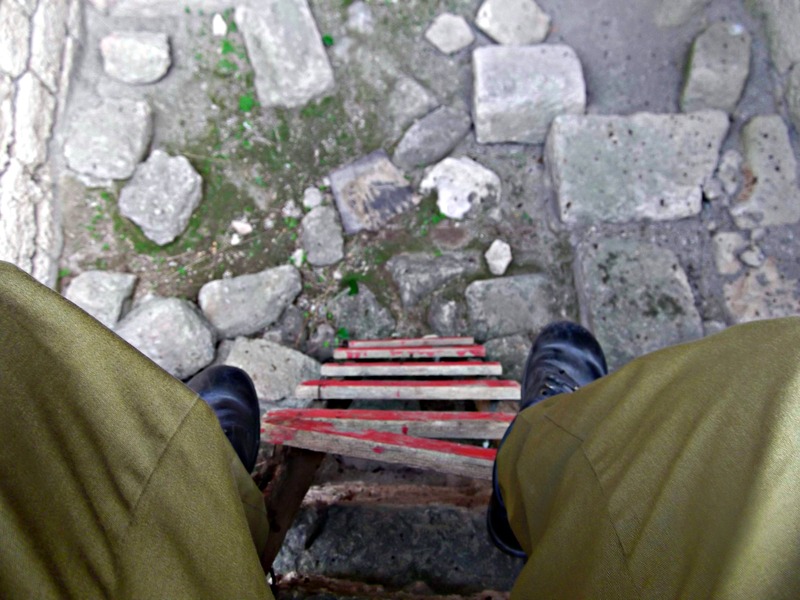 I walked and walked, not letting myself get too distracted, until I reached train tracks. 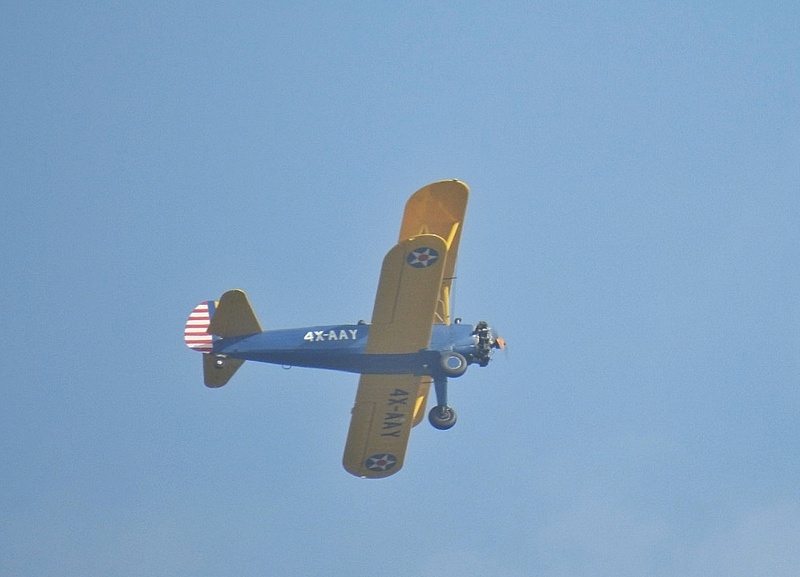 Continuing on with the trail, I then saw a peculiar sight: a Boeing-Stearman biplane painted blue and yellow passed overhead. I attempted to look up the plane’s N-number, the international registration number, but my search attempts on the FAA’s website turned up empty. 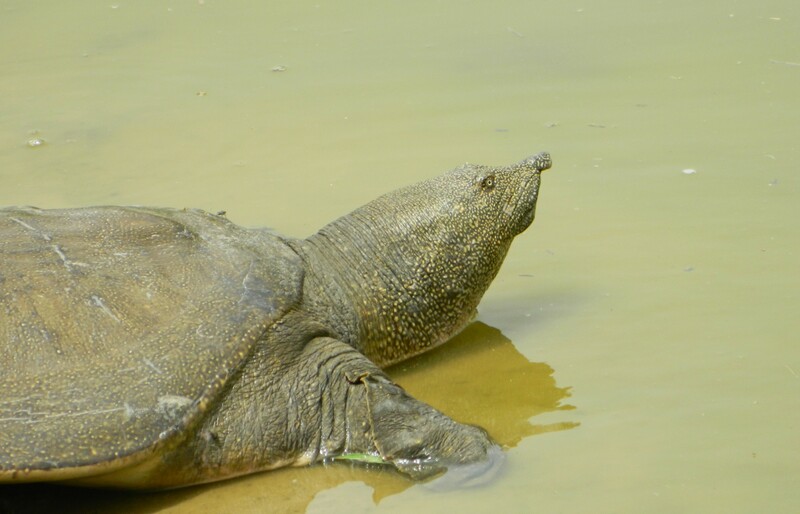 Eventually, after seeing some corn buntings – also harbingers of spring – I arrived at the famous bridge where the African softshell turtles congregate. Since I’ve already written about this experience before, I shall resume with the continuation of the trail alongside the sluggish stream. We walked and walked, passing countless eucalyptus trees, plentiful cormorants and a few handfuls of black-headed gulls flying high up in the sky. Every so often there would be a sign informing us of our progress, and of the stream’s rehabilitation efforts over the years. An hour or so after we left the bridge we arrived at another bridge, and then to the grand feast put out by the school kitchen staff. The next hour or two was dedicated to feasting on chicken skewers, fries, mini baguettes, salad and more as the entire school trickled into the feasting field slowly. Just as the last people were receiving their portions the skies opened up and rain began to pitter-patter on heads and shoulders. Thankfully the buses had arrived and, after cleaning up our trash, we piled in to be taking to Kfar HaRoeh for the rest of the day’s activities. 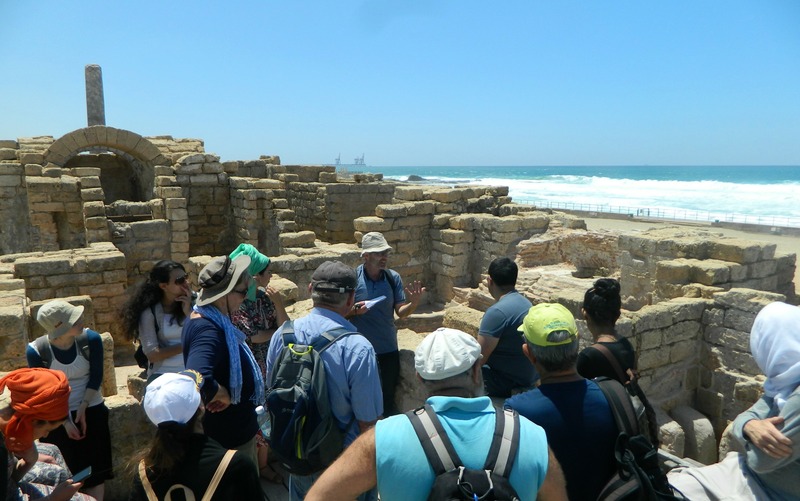 A month ago I joined fellow students and faculty members of my department in Bar Ilan University for a two-day trip to the Carmel region. 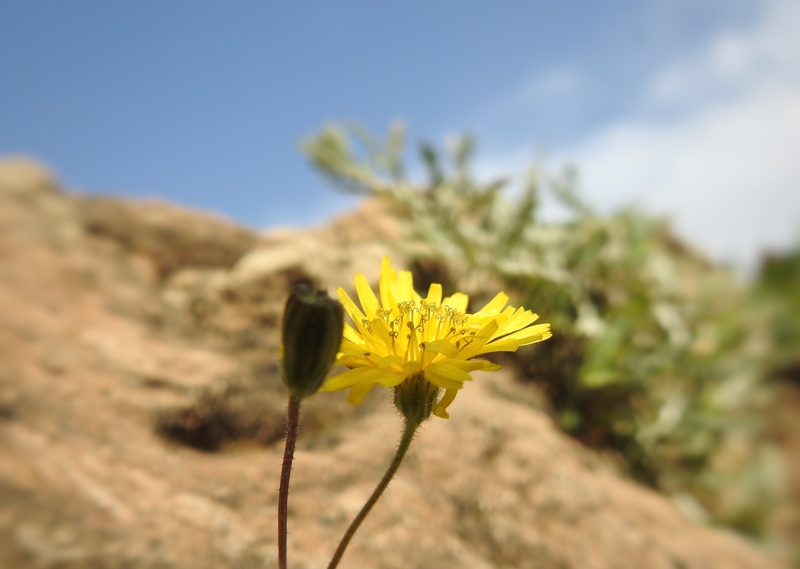 Similar to our trip to the Wadi Qelt region, this involved the effort and participation of the whole department, with just a lot less hiking. Our trip began at the campus where we boarded our tour bus and set out on the road. 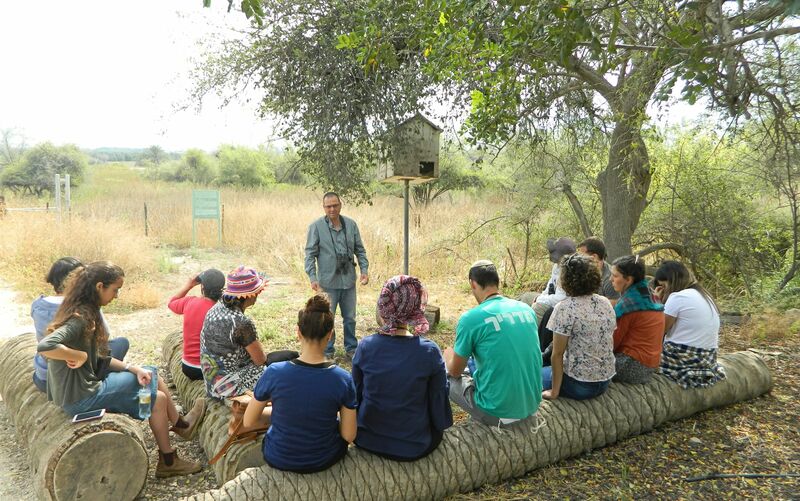 The first stop of the day was Nachal Alexander to learn about the African softshell turtles with Dr Moshe Natan, as some of us had done several weeks prior on our trip to Bet Shean Valley and Agamon Hefer. 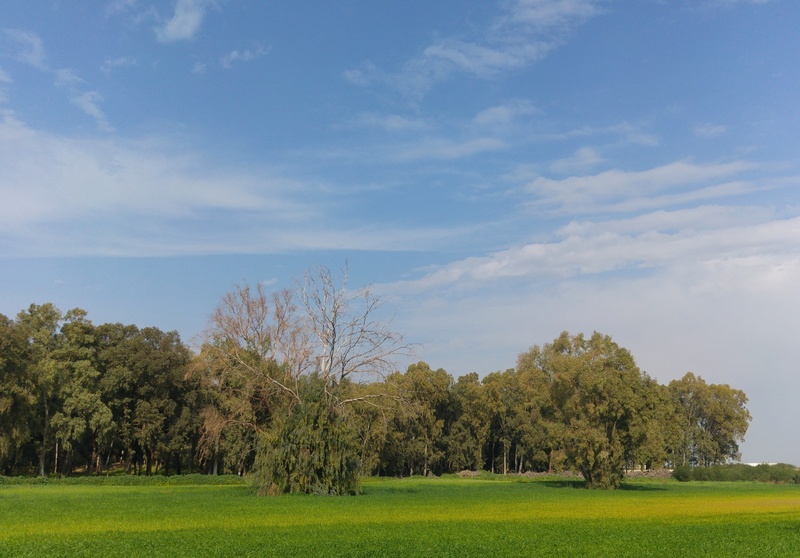 From there we drove to see some Egyptian fruit bats and then to Ramat HaNadiv, a fancy gardens which are home to the remains of the Baron and his wife Rothschild. However, we did not enter the fancy gardens, but instead found a dirt path that led us into the wilderness. 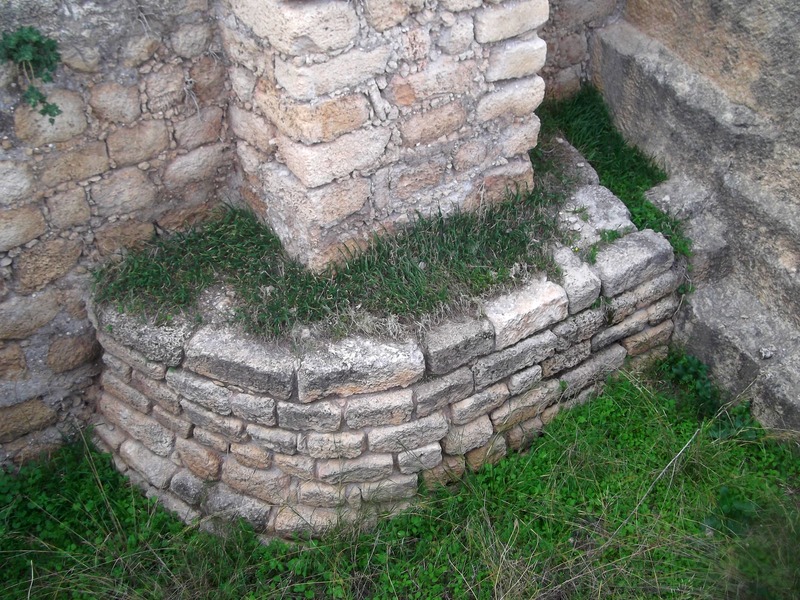 There, surrounded by interesting plants, bee-eaters and noisy cicadas, we came upon the first structure of the Horvat Eleq ruins. 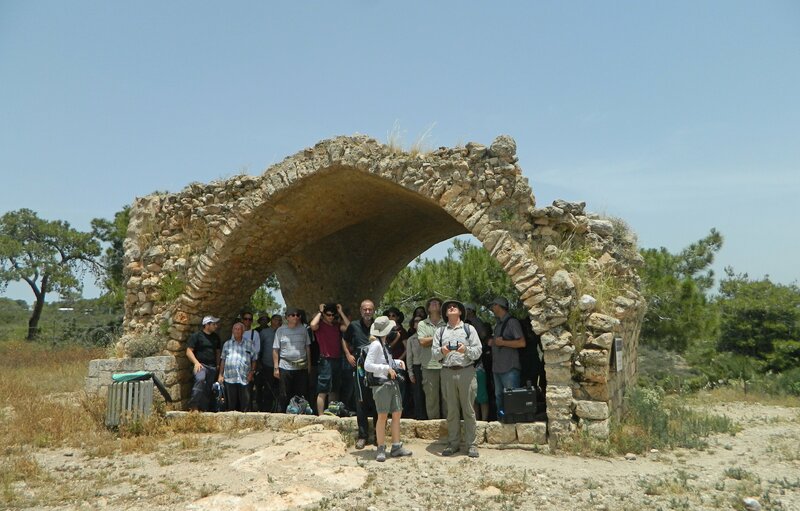 We sat in the shade of the vaulted structure and listened to a series of short lectures by faculty members such as Prof Lilach Rosenberg-Friedman and Dr Amit Dagan on the history of the region. 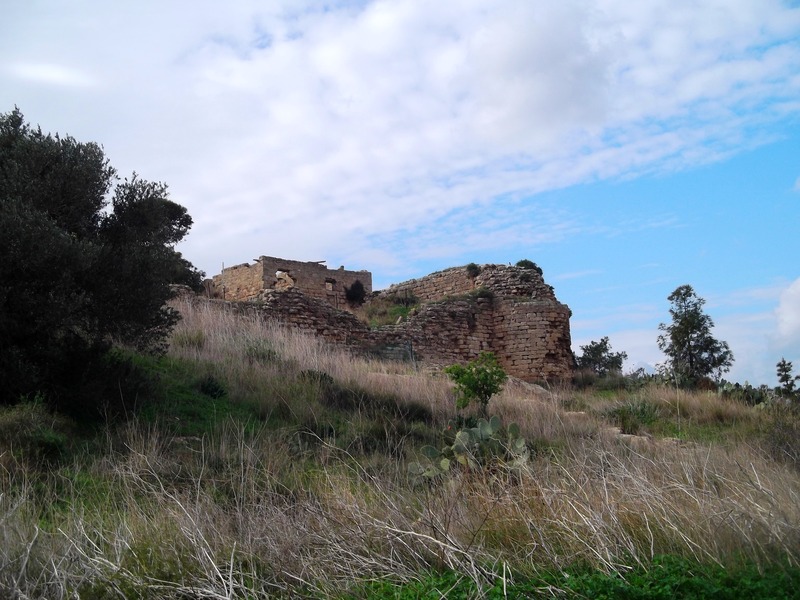 Moving onward, we came across more ruins, these being a large fortified palace from the early Roman era, which were explained to us by Dr Avner Ecker. Just a short distance away we found the ancient columbarium, a circular tower from the Roman era that housed thousands of pigeons and doves. 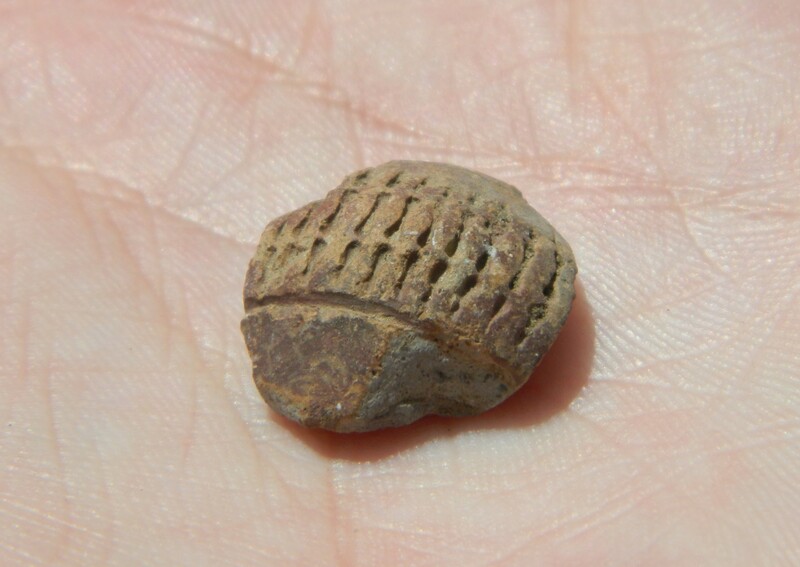 Outside the columbarium my friend Eitan found a piece of a Ottoman-age tobacco pipe, always a fun find. Just below the columbarium there is a cave with an underground spring gushing forth clear water. 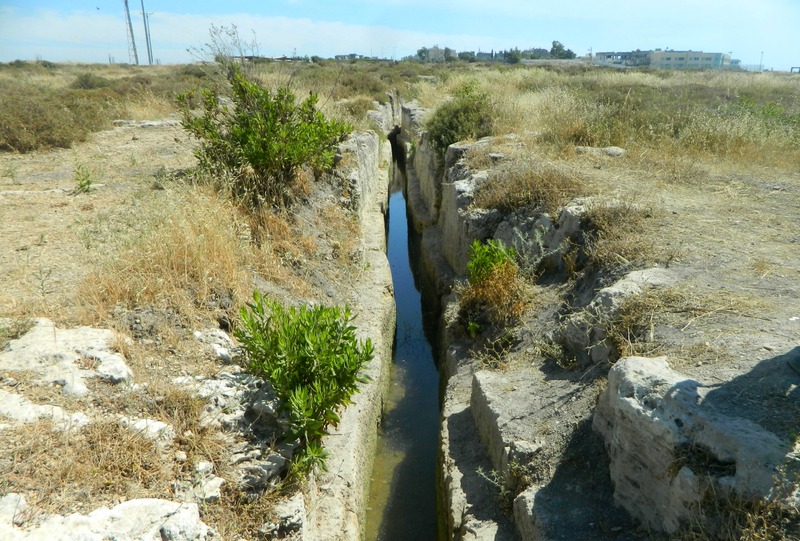 During the Roman era an aqueduct was built to channel the water out from the cave and into a large rectangular pool. 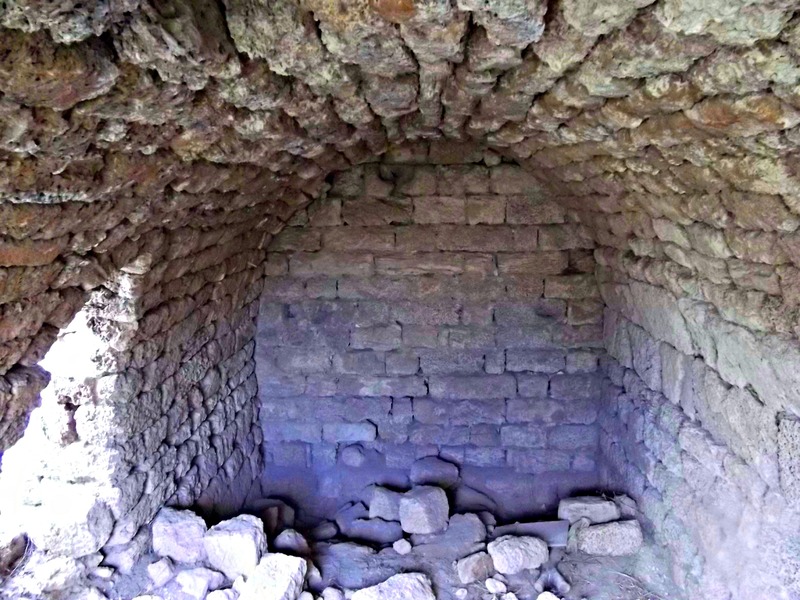 We admired the curious little aqueduct and then entered the cave, where we found ancient masonry and, towards the end, a modern metal gate blocking further progress. 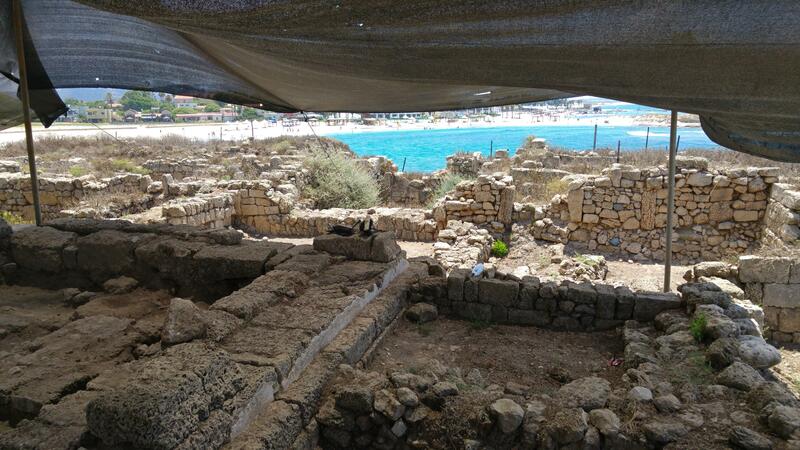 Beyond the pools we found the remains of a Roman bathhouse, a rather small one in comparison to the others found in Israel. 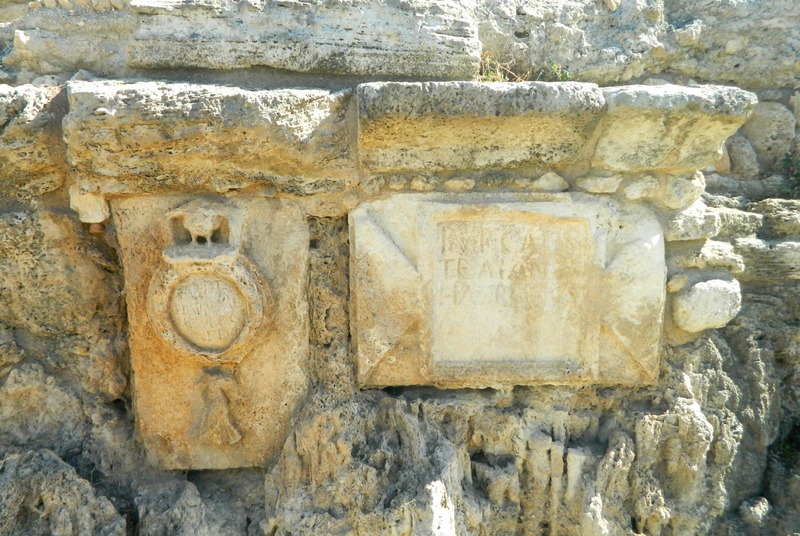 When we had satisfied ourselves with looking at the frigidarium (cold water room), the tepidarium (passage between cold and hot rooms) and the caldarium (hot water room), we had a lunch picnic in the shade of the nearby trees. Songbirds and a gently flowing stream added to the tranquility of the setting, making it hard for us to leave. There was still much more to see so we got up and hiked our way out of the wilderness, where our bus was waiting to take us to the next site. 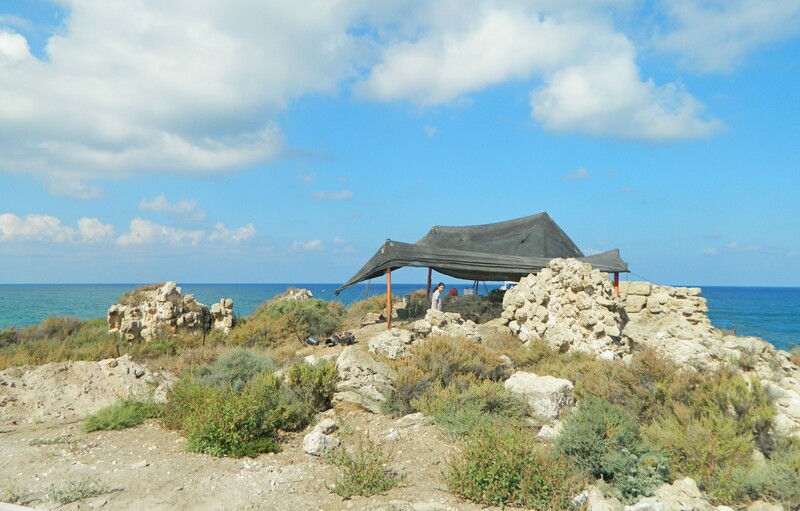 We drove over to Nachal Me’arot, to look at the famous Carmel Caves that contributed so much to prehistoric archaeology. 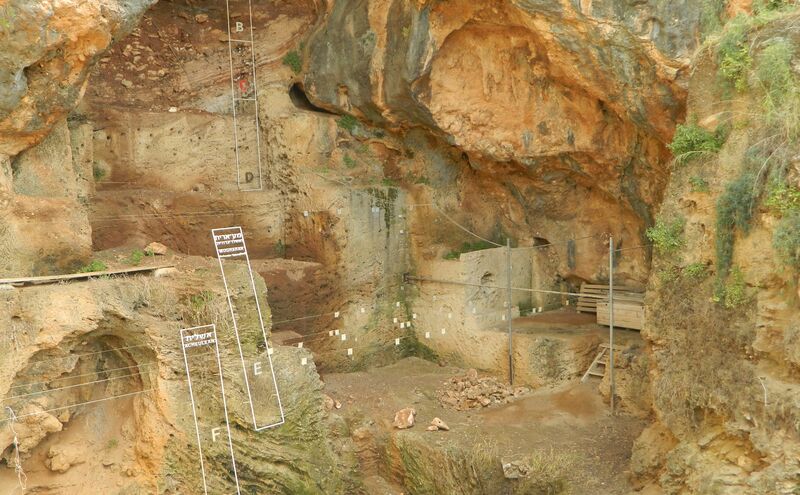 Our resident prehistorian, Dr Nira Alperson-Afil, lectured us on the importance of the four caves where findings such as burials, tools and dwelling structures from a variety of prehistoric periods were made. 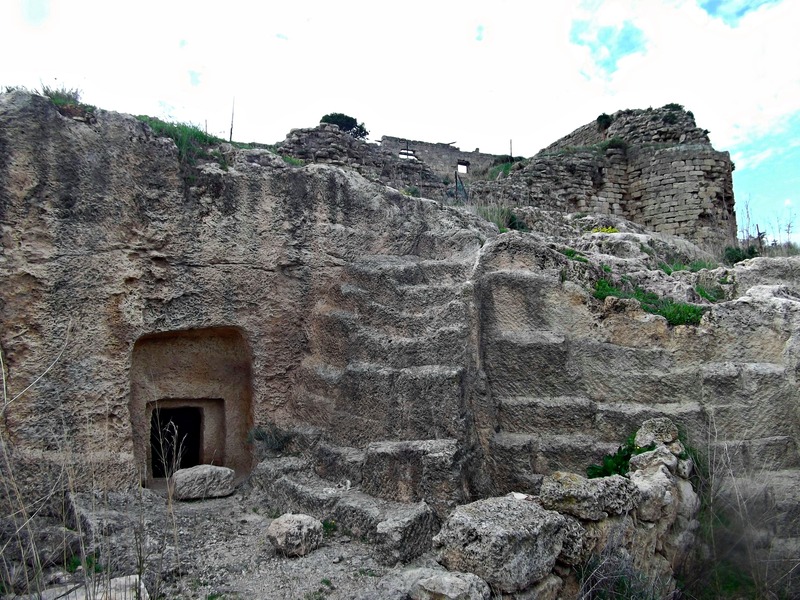 We hiked up the slope towards the first of the caves, the chimney-shaped Tabun Cave where levels of sediment amassed over the thousands of years, trapping prehistoric remains in the layers. 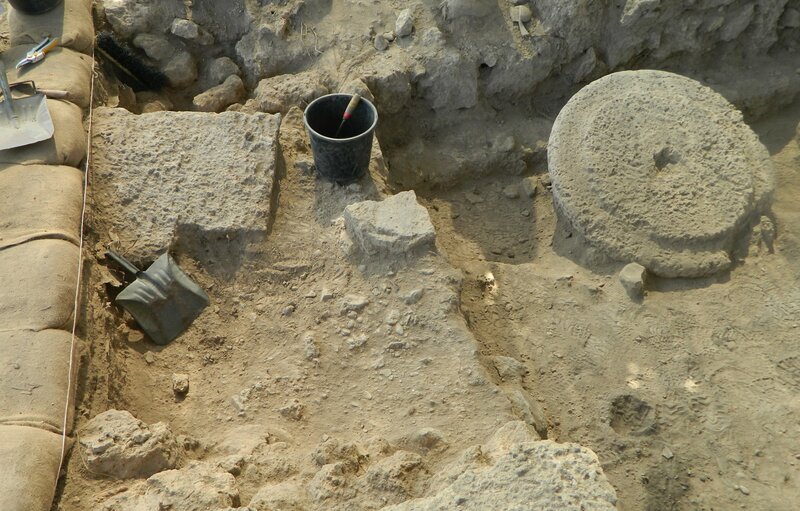 Archaeological excavations began in 1927 and continue to uncover integral information of prehistoric cultures. Next we examined the Gamal Cave with its artistic representation of a prehistoric scene, complete with a model man and woman, stretched out pelts and more. The next cave was my favourite, with its long colourfully-lit tunnel. 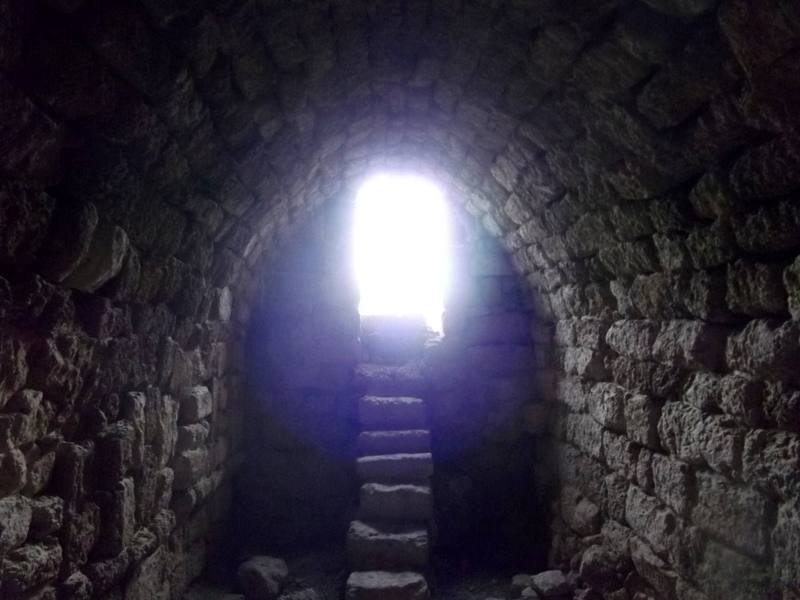 Inside, at the end, we watched a short film about life in caves during prehistoric times. 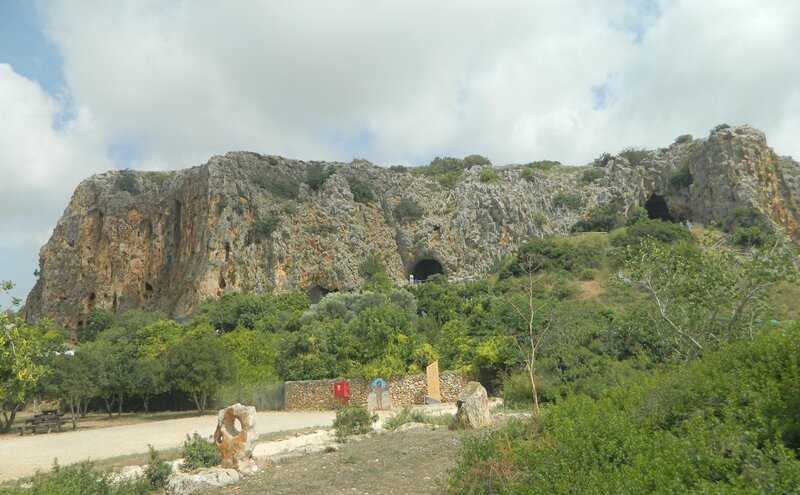 Finished with the caves, we made our way back down the mountainside and onto our bus to be shuttled off to the next site. 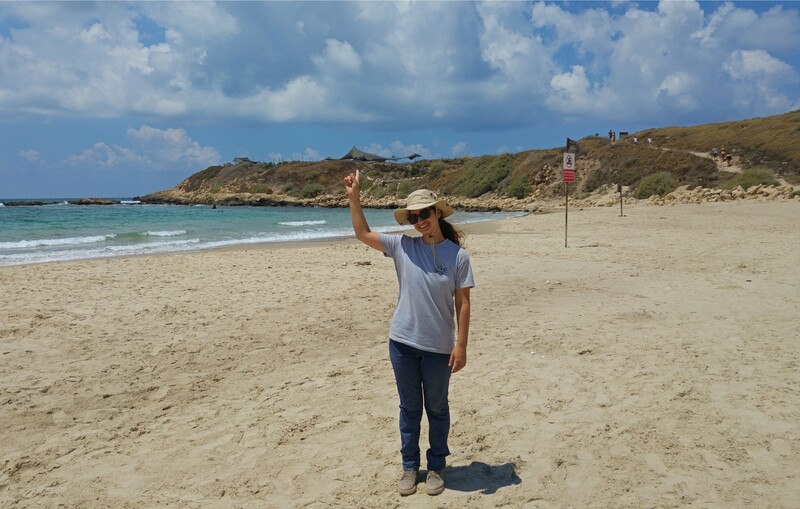 Just a short drive away, the nature reserve of Dor HaBonim encompasses a stretch of coastal land comprised of a kurkar ridge with small sandy beaches here and there, and a number of interesting things to see. 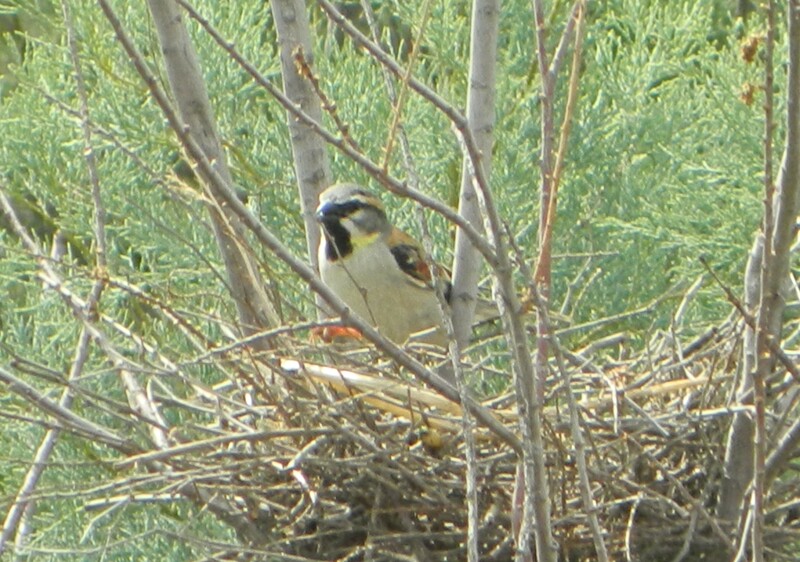 Our trail began just outside of Shell Beach where I spent quite a few minutes birding. All that I could come up with was a corn bunting, some crested larks and a handful of gulls. 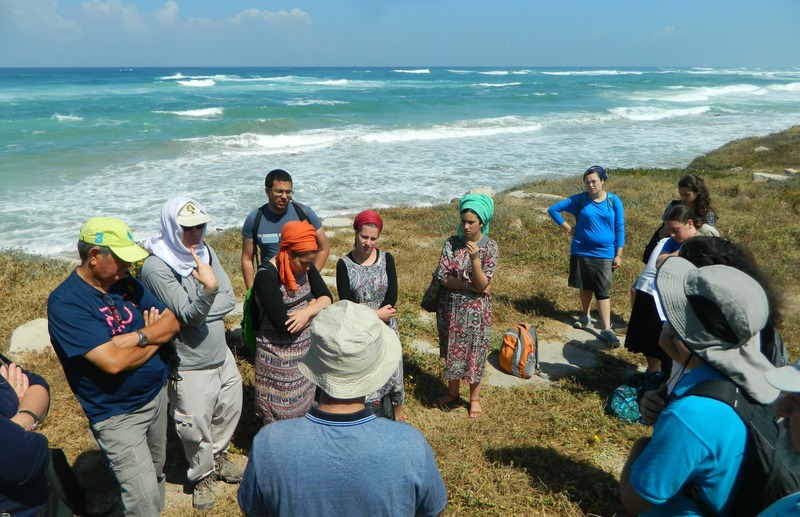 Back with the group, we listened to Dr Dvir Raviv and others talk about the geology and history of the area and then we moved on. 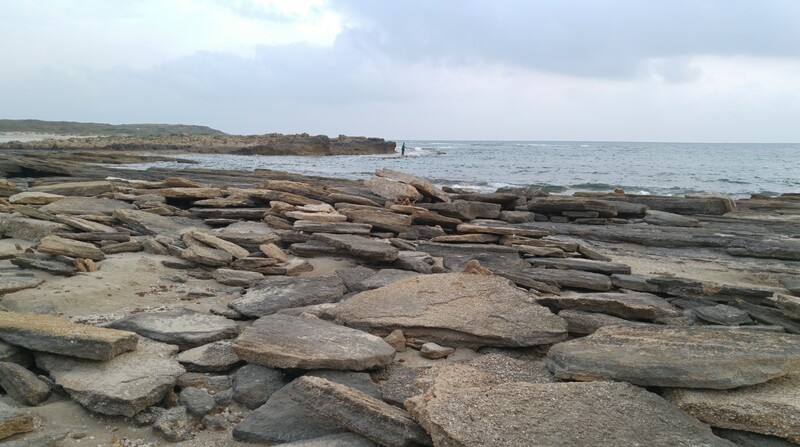 The plan was to walk along the coast from HaBonim to Dor, where we’d be spending the night. The timing was perfect, as the sun was slowly setting, and we had a couple kilometres of walking to do. 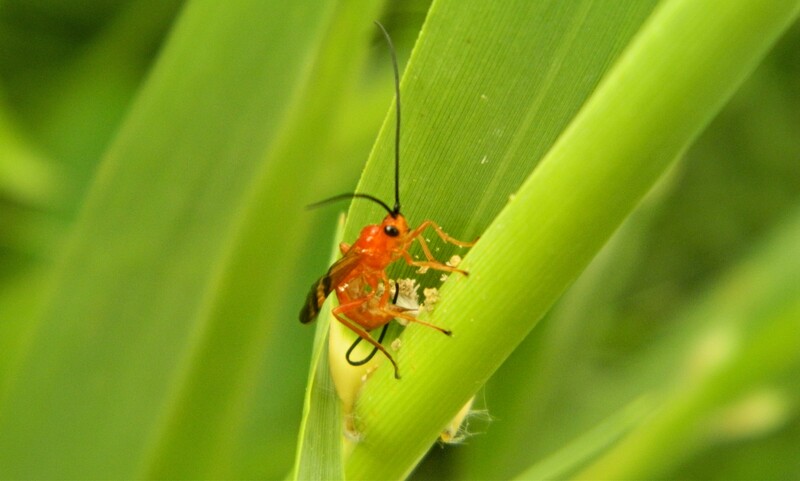 In certain places, unbeknownst to us, we encountered huge swarms of mosquitoes which drank heavily from our lifeblood. As we walked we came across several interesting areas, like the Sandy Cove and the Kurkar Quarry, each with their own geological or historical story. 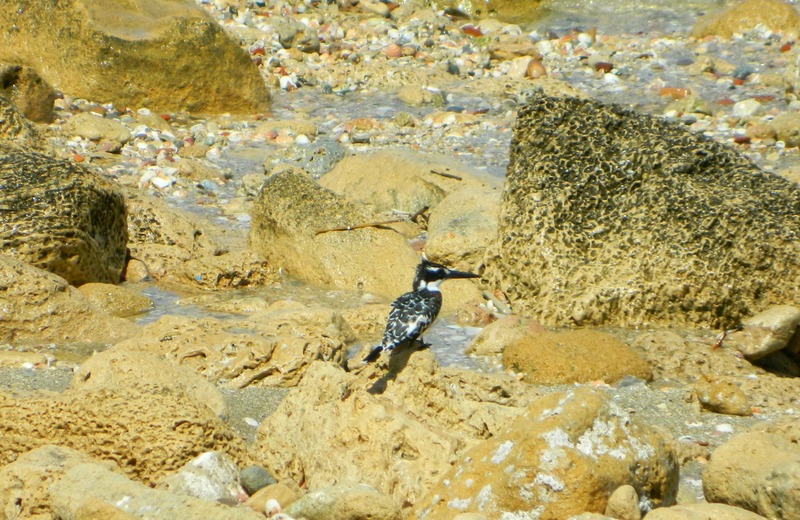 I kept my eyes out for interesting sea-going birds but saw nothing but gulls, and not even peculiar ones at that. 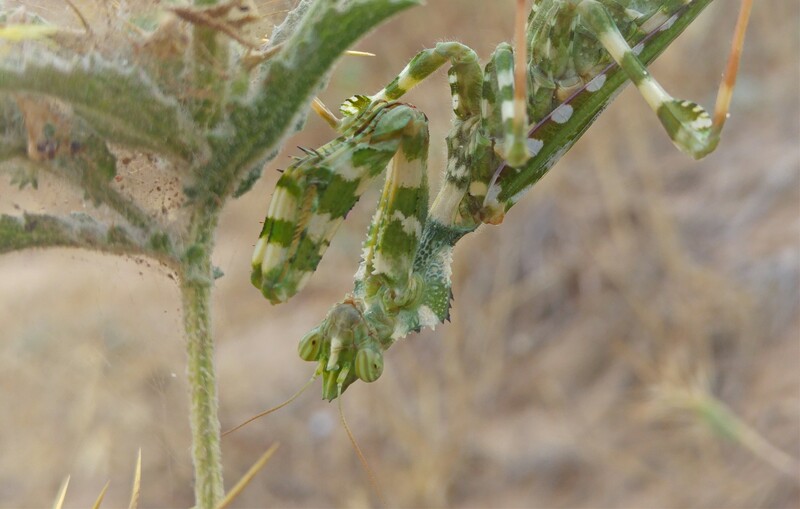 There were some curious flowers, wild herbs and even a thistle mantis which posed most professionally. 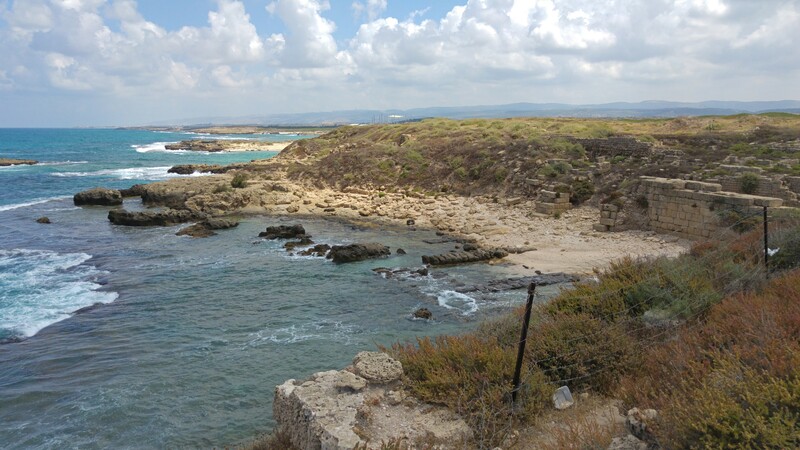 Two hours after we began our tour of the coast we at last reached Tel Dor, famous in part for being the southern end of Phoenicia. 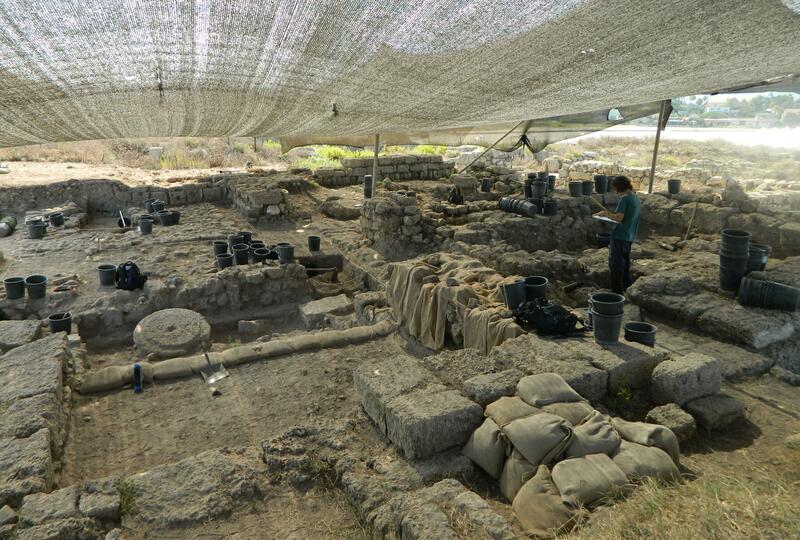 There, standing near the excavated ruins of the ancient city, we listened to Prof Aren Maeir speak. At this point the sun was nearly set and we traipsed through the sands of Dor towards a distant restaurant where we’d be eating dinner that night, a rather delicious dinner at that. 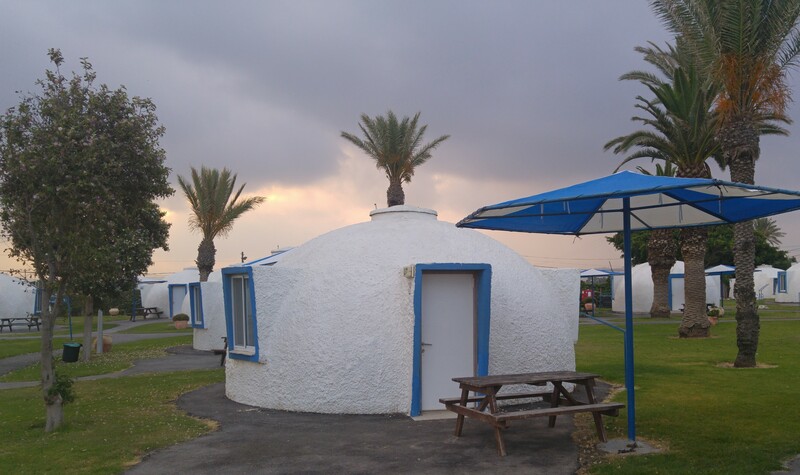 After dinner we were shown to our rooms, which were actually small domed structures that held a divided room, kitchenette and bathroom with shower in each. I shared my dome with two friends and woke up the next morning extra early to do some sea- and shorebird watching. 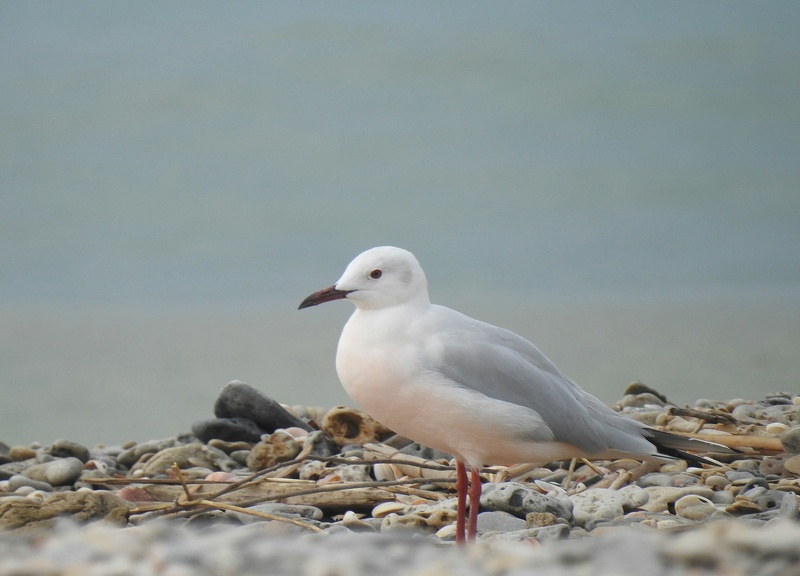 Again, not much success as I mostly saw the standard Israeli gulls. After praying at the nearby synagogue I rejoined the group for breakfast at that same restaurant, a very satisfying experience. The day’s tours began at the nearby Mizgaga Museum where we heard about the museum’s origin story and the history of the area from Dr Kobi Cohen-Hattab and Dr Avi Picard. With that we boarded our bus and were driven up Mount Carmel to pay a visit to the memorial for those killed in the terrible wildfire that ravaged the mountain in 2010. There, in the shade of the twisted metal structure, we heard from Dr Tamir Goren, another of the department’s experts in the modern era. We were then shuttled over to the trailhead of the Little Switzerland area trail, where we struck out at brisk pace through the mountainous woods. We stopped here and there along the way and eventually had a nice long break in the curve of a geological formation on the mountainside. 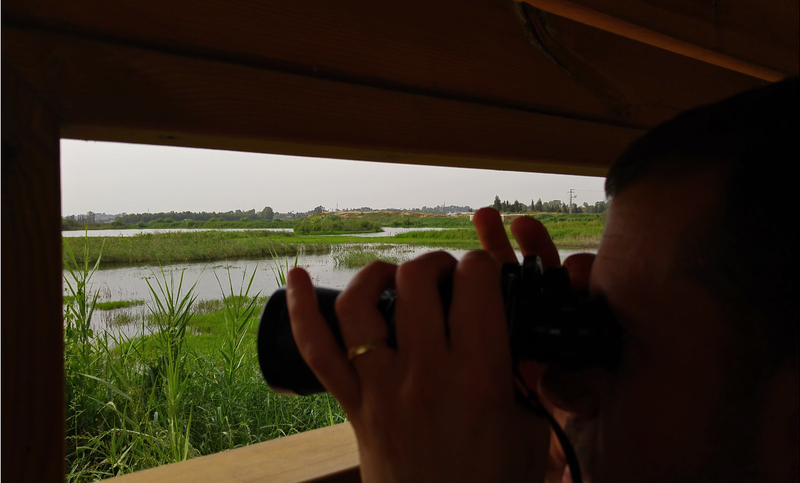 This time there were birds to be seen, and interesting ones at that, such as a pair of short-toed eagles calling to each other in flight, an Egyptian vulture and a Griffon vulture that stayed overhead long enough for the majority of the group to get a look. It wasn’t just birds that captured my attention, a pair of dung beetles were making their way down the trail, rolling a small ball of dung with them – something that I’ve never seen in person. 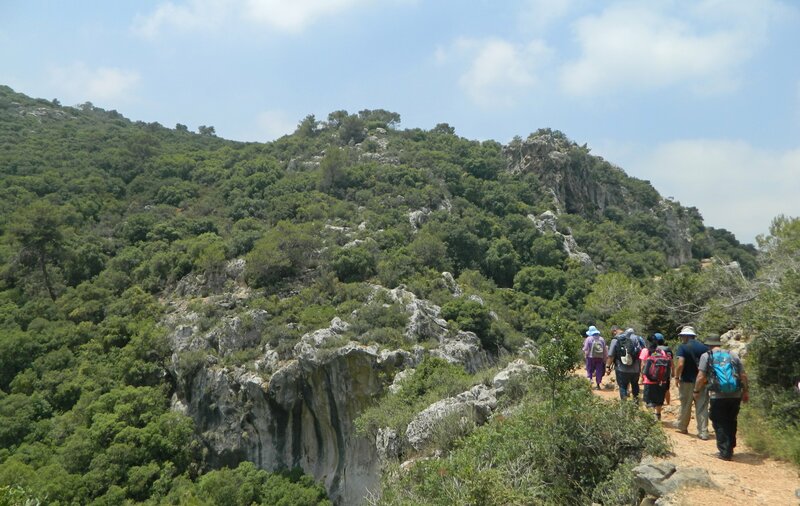 Eventually, after about an hour and a half of humid hiking, we got back onto the air-conditioned bus to be taken to the nearby Druze village of Daliyat al-Carmel. There, feeling like a giant group of tourists, we scattered for some free time to shop, browse, eat and enjoy the sights. I was even able to get a few bites of kosher-certified baklawa from the best shop in town (or so they say), courtesy of Dr Amit Dagan. Reconvening, we walked through the Old City and listened to some short lectures outside of the Yad L’Banim building. Then, it was back to the bus and over to the heart of Haifa, to the Bahai Gardens themselves. 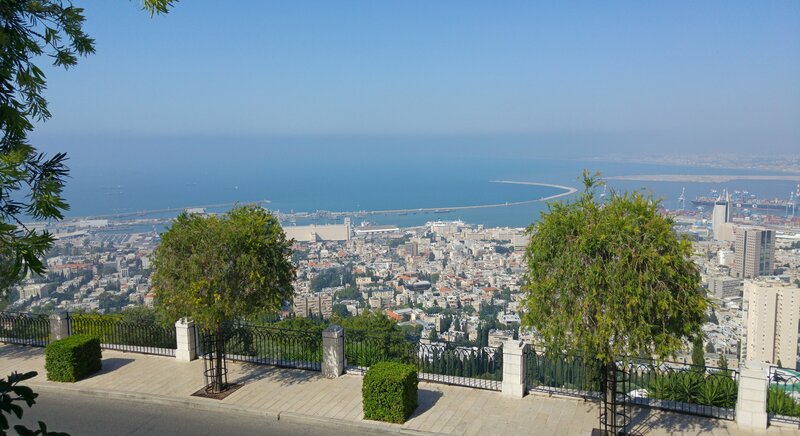 We sat back and relaxed on stone steps after taking in the incredible panoramic view of the city, the bay and all that the eye can see of the Western Galilee. A couple more short lectures were given, including one by Prof Eyal Regev, and then the trip came to a close. It was hard to believe that this long and exciting trip would ever end, but it was getting late and people had to be places. So, we began the journey back to Bar Ilan University, feeling happily overwhelmed and satisfied with yet another incredible trip offered by our dear department. 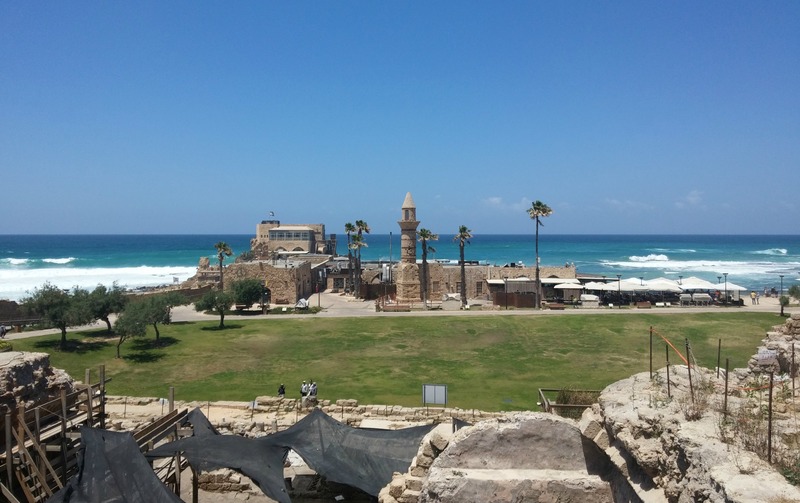 Following our visit to the Mizgaga Museum and the coast of Dor, my father and I continued on towards Zichron Ya’akov, just a few minutes away. 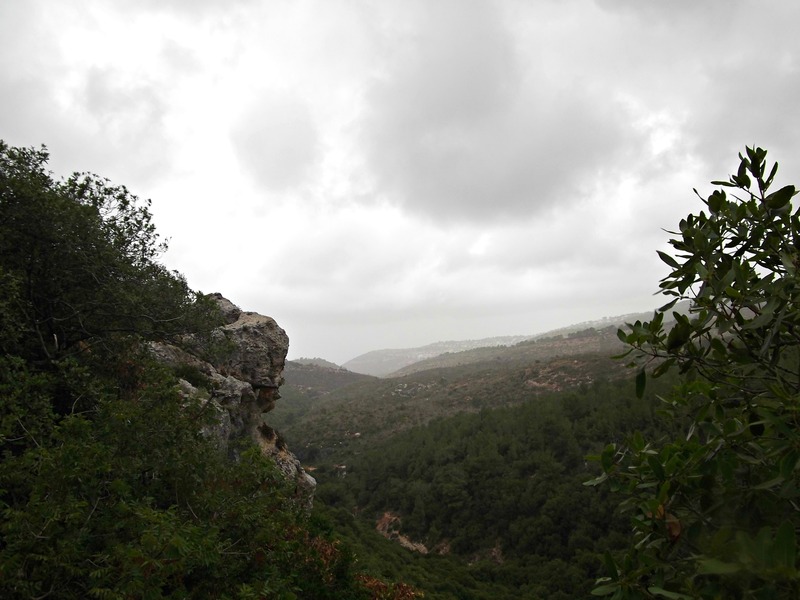 We entered the town from the north, climbing slightly in elevation – Zichron Ya’akov being at the southwestern corner of the Carmel range. Founded in 1882 by Romanian immigrants, the Baron Edmond James de Rothschild took administrative and financial charge in 1883 in building a proper town – one of the first agricultural colonies established in the Holy Land. 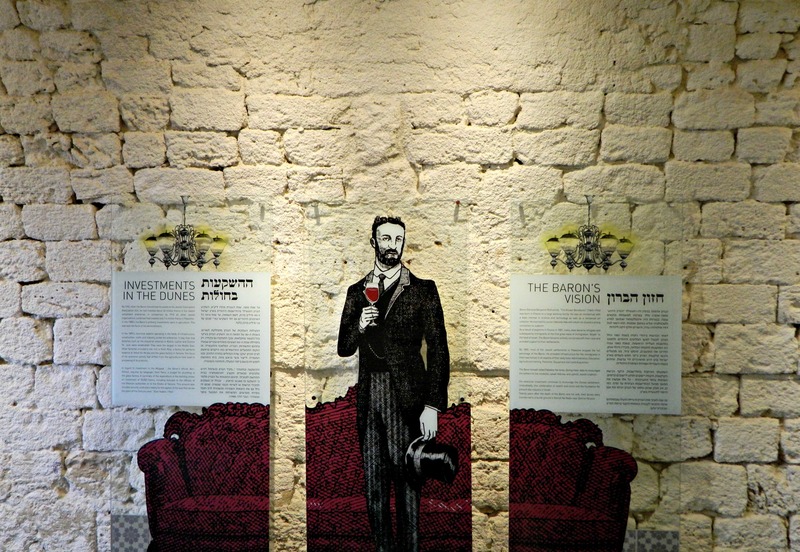 Zichron Ya’akov translates as the “Memorial of Ya’akov”, referring to the Baron’s late father James (Ya’akov) Mayer de Rothschild, a powerful banker and the founder of the French branch of the Rothschild family. 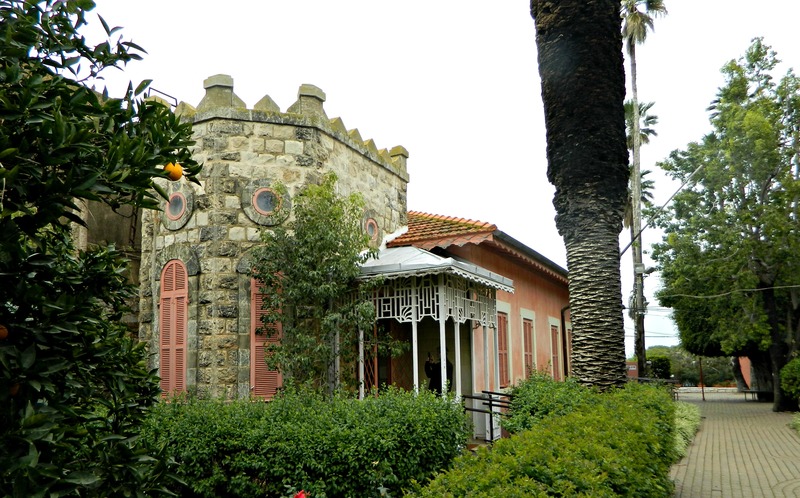 In 1885 Baron Rothschild created modern Israel’s first winery, the Carmel Winery, which we passed on drive through the town. 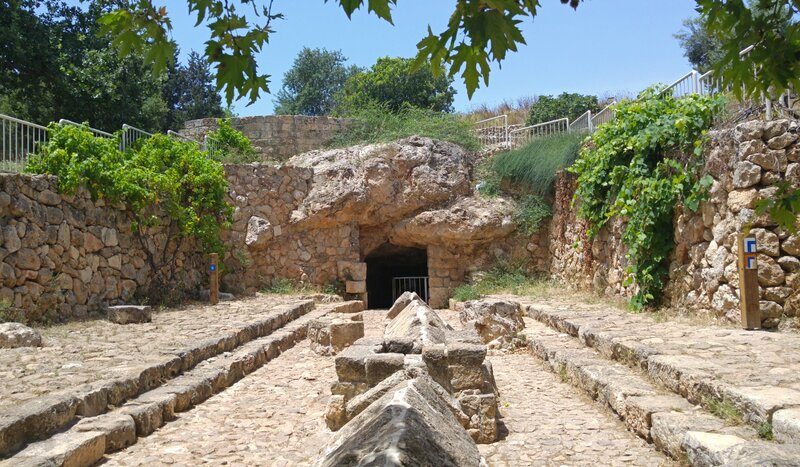 Today there several wineries in Zichron Ya’akov and neighbouring Binyamina, including the Tishbi Winery which I had the pleasure of visiting, also opened under the patronage of the Baron. We briefly drove through the northern section of the original town before parking next to the First Aliyah Museum, which, unfortunately, is closed on Sundays. We continued on foot, heading to the heart of the old town. Filled with quaint charm, even just walking down the street feels like an adventure. 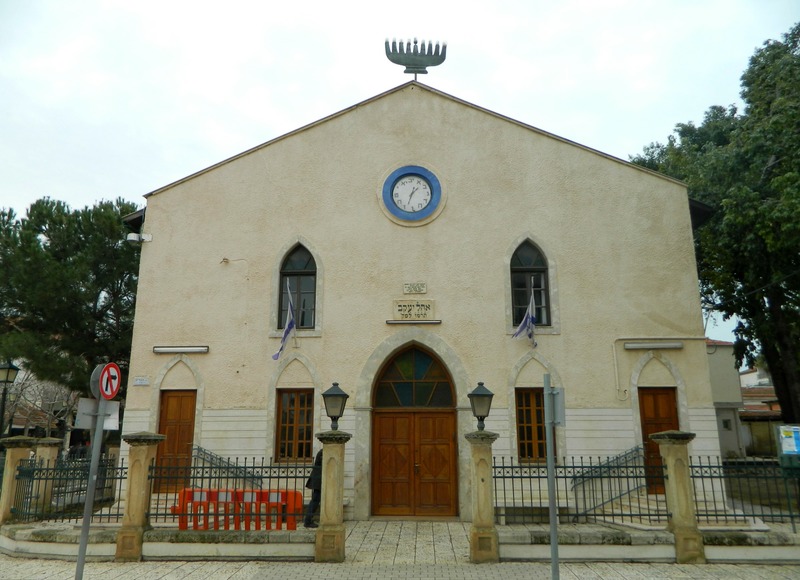 Before long we came upon Bet Knesset Ohel Ya’akov (“Tent of Jacob” in English), a synagogue built in 1884 by Baron Rothschild in honour of his aforementioned father. The synagogue was locked at the time we happened upon it, so we were unable to gaze upon the beautiful white marble interior. Turning the corner onto HaMiyasdim (Founders) street, we began the town’s “Midrachov” of old house, quaint shops and welcoming restaurants and cafes. This main street, pedestrians only, was designed by the Baron’s city planners and the flanking houses were built inspired by French architecture. 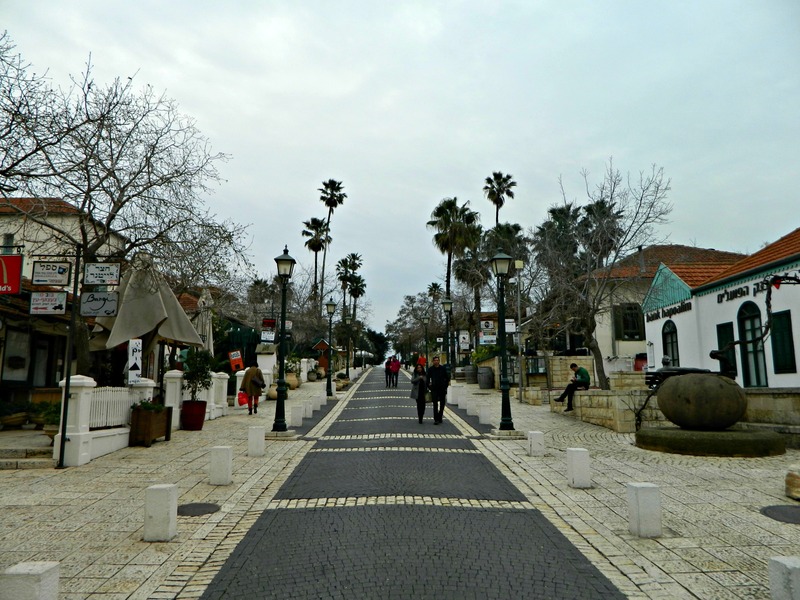 Being as that some 20% of Zichron Ya’akov’s residents are “Anglos”, we heard quite a lot of English as we strolled down the street taking in the sites. 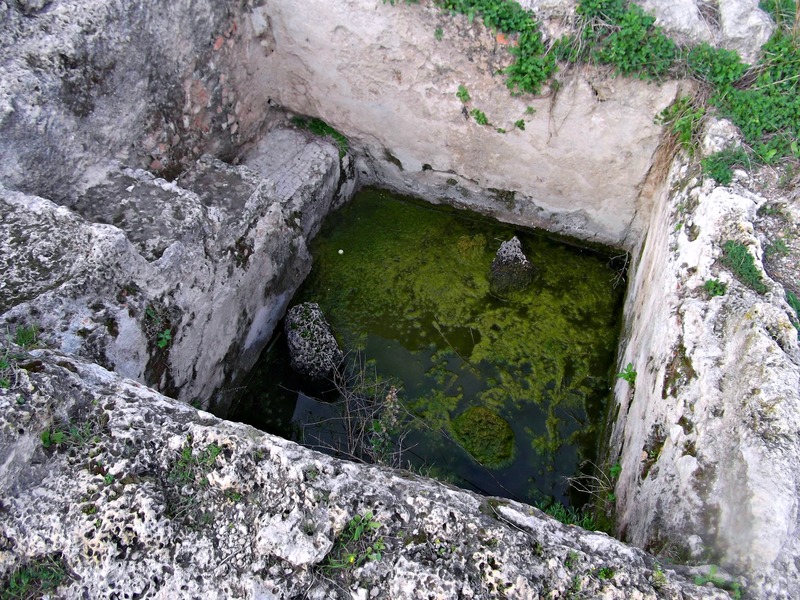 There is one structure dating back to 1891 called Benjamin’s Pool, a fountain of sorts with a large arched facade complete with a small aqueduct stretching out behind it to supply drinking water for the residents. At the time of our visit we saw some restorative work being done. At the next corner we found Beit Aharonson (alternatively, the Aharonson House) which holds the NILI Museum. 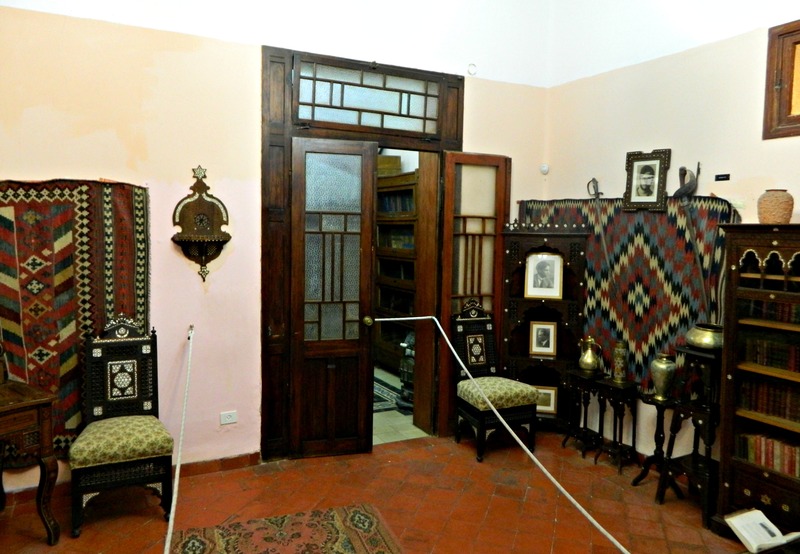 Entering the grounds, we browsed the museum’s house of artefacts and exhibitions concerning this mysterious NILI I knew nothing about. 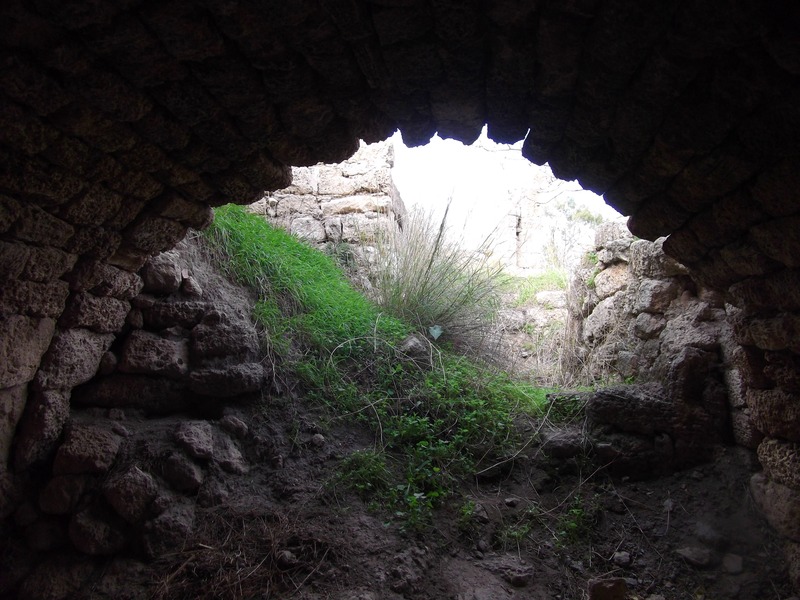 Somehow, in the annals of modern Israel’s history, the incredible tales of the NILI spy ring have been overlooked by most, but deserve more coverage. Set in WWI, the NILI espionage network relayed important information to the British, concerning Ottoman troop numbers and locations among other sensitive information. Originally known as “Organisation A” by British Intelligence, the Zichron Ya’akov-based group adopted the name NILI, the English equivalent for the Biblical acronym “Netzach Yisrael Lo Yishaker” which translates as “The Eternal One of Israel shall not lie…”. Founded by locals Sarah, Aaron and Alex Aaronsohn as well as Avshalom Feinberg, the network reached some thirty secret members in its prime. Due to Aaron Aaronsohn’s position as regional agronomist and world-famous botanist, the members who worked with him on fighting ravaging locusts were allowed to travel freely and were thereby able to make detailed reports on the Turkish strategies and troop deployment – often using the Jewish Agricultural Experiment Station in Atlit as their headquarters. With the British closing in, coming from Egypt and Sinai, the Ottoman Empire was at risk of losing their control over the Holy Land that they’ve had since 1516. NILI used two main methods of relaying information to the British. 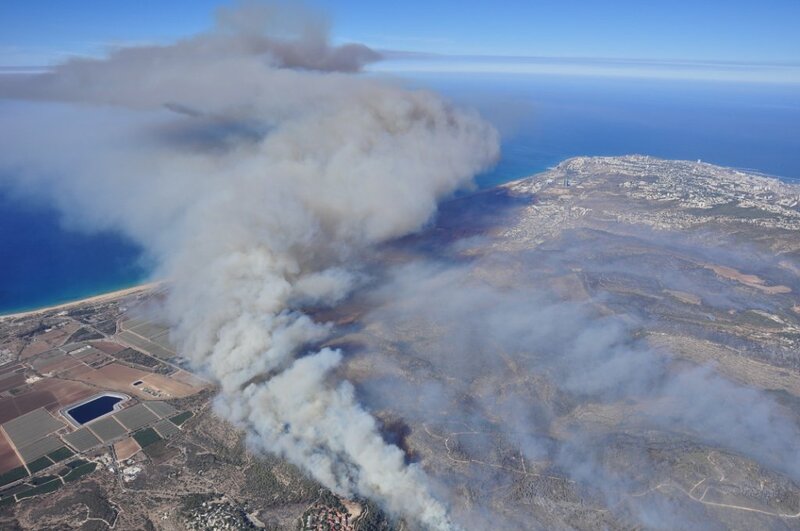 The first was Monegam, a boat disguised as a cruise ship which approached the coast near Atlit and NILI operatives physically went to the boat to deliver. Once this became too risky, due to the Turkish suspicions and the threat of German submarines, NILI began with their second method, carrier pigeons, which flew their Atlit – Port Said route with coded messages attached to their legs. 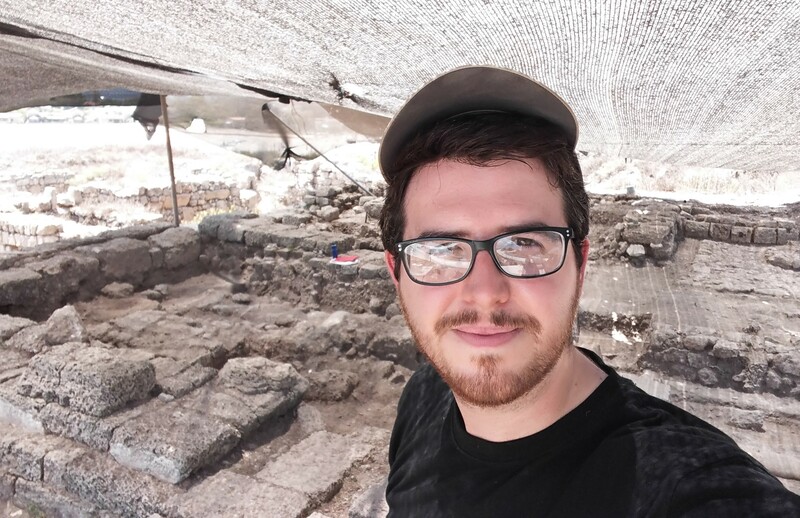 At one point communication between NILI and the British was lost and so two key members, Avshalom Feinberg and Yosef Lishansky, decided to go to Egypt themselves to reestablish contact. Disguised as Bedouins, the two ran into actual Bedouins in the desert and were attacked. Avshalom was mortally wounded and left to die while Yosef managed to escape injured, and eventually reached Egypt. 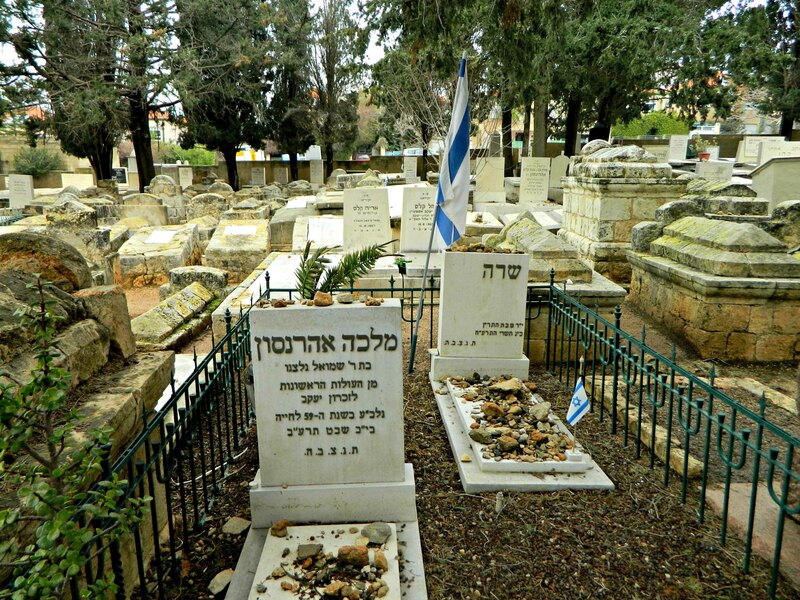 Remarkably, Avshalom’s body was found in 1967 after the Six Day War. 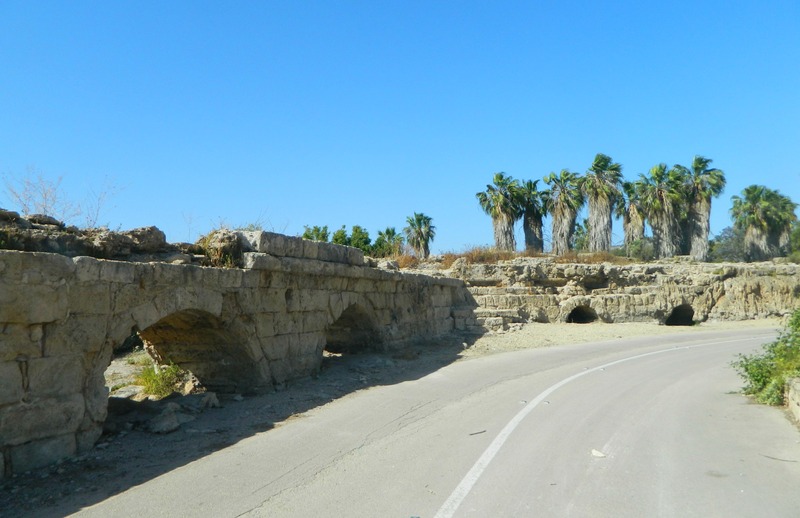 An IDF officer was told by local Bedouins that a certain lone palm tree was known as the “Jew’s Grave” and after a careful excavation Avshalom’s bones were discovered, the tree having grown from a date in his pocket fifty years back. 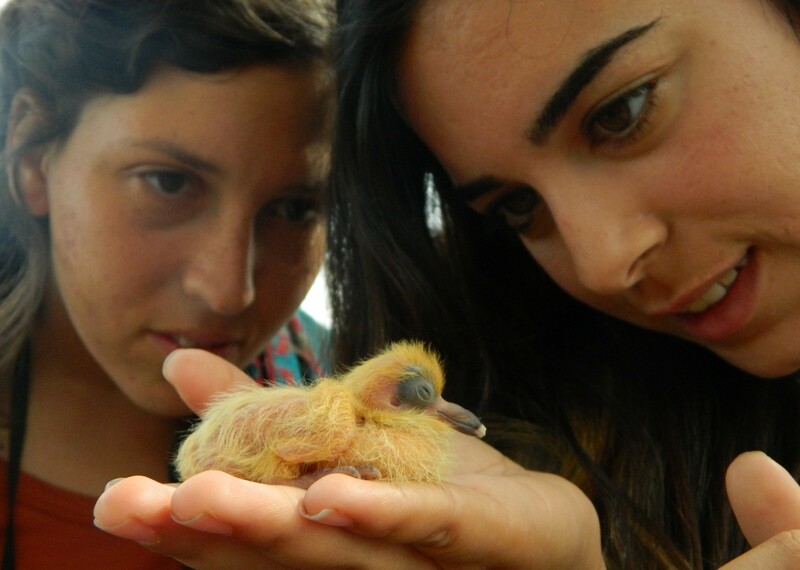 Shortly after Avshalom’s death, in 1917, one of the the pigeons accidentally landed in the pigeon coop of the Turkish governor of Caesarea and, after decrypting the message, one NILI member was captured and tortured. He gave up names and information which led to more arrests and more torture. 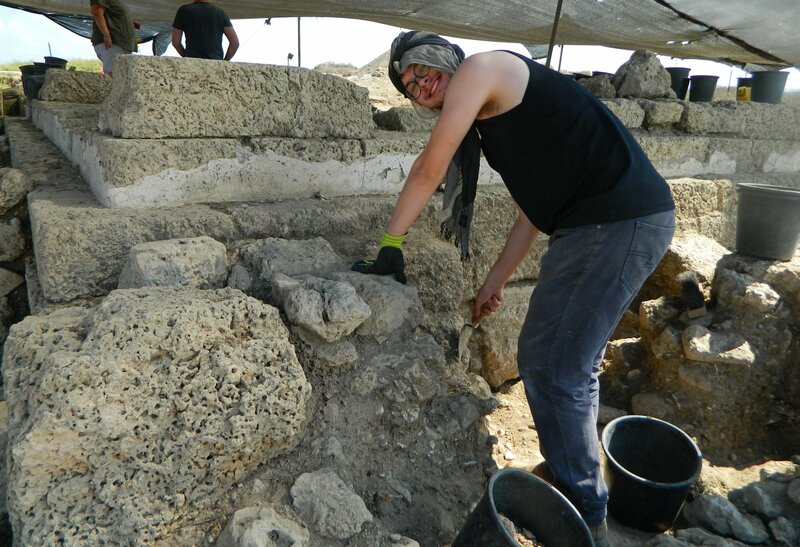 Suddenly, British gold coins were found in the Ramle market and NILI began to collapse. Sarah Aaronsohn was arrested and tortured and, surprisingly, allowed to return home under armed guard where she wrote a suicide note and, taking a concealed pistol out of a secret door-frame compartment, shot herself in the bathroom. It took her four days to succumb to her wound but she persisted in taking the fall as head of NILI in hopes to spare others. With NILI disbanded, many of its members already dead, Aaron Aaronsohn met an untimely death in 1919 when his plane fell out of the sky somewhere near Boulogne, France. His body was never recovered. Despite NILI’s short-lived operation and their somewhat controversial methods, they were instrumental in securing British victories in numerous battles for the Holy Land which eventually led to the British conquest. We watched a short film about NILI and the Aaronsohn House before taking a guided tour of the two original houses on the property. We saw both the secret door-frame compartment (as can be seen above) and the secret trapdoor, delightful old spy tricks. 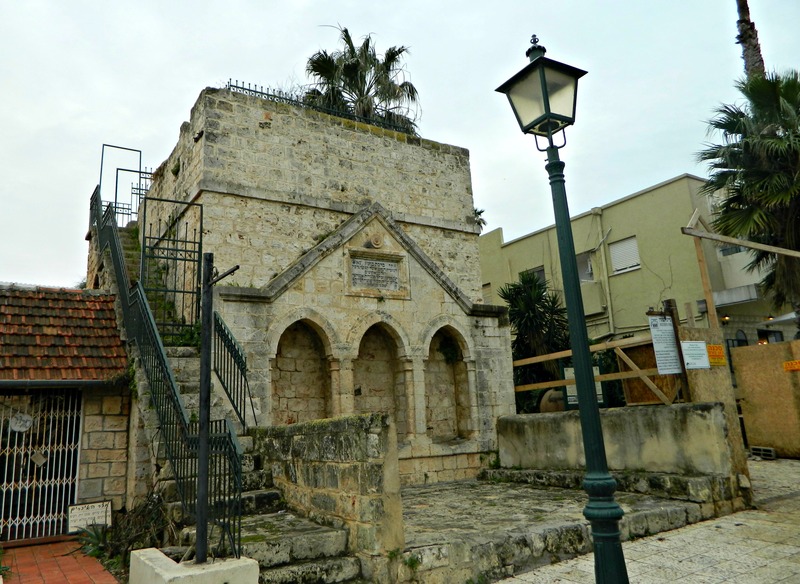 After taking leave of the residence, we continued on down the street until we reached the arched entrance of the original town and Zichron Ya’akov’s cemetery. Entering, we found the old graves of some of the NILI members including Sarah Aaronsohn which is surrounded by a little wrought iron fence. After spending a while at the cemetery, deep in thought, we attempted to visit the Visitor Centre but we found that it was closed. We headed back up the cobbled main street and perused the restaurants along the way. 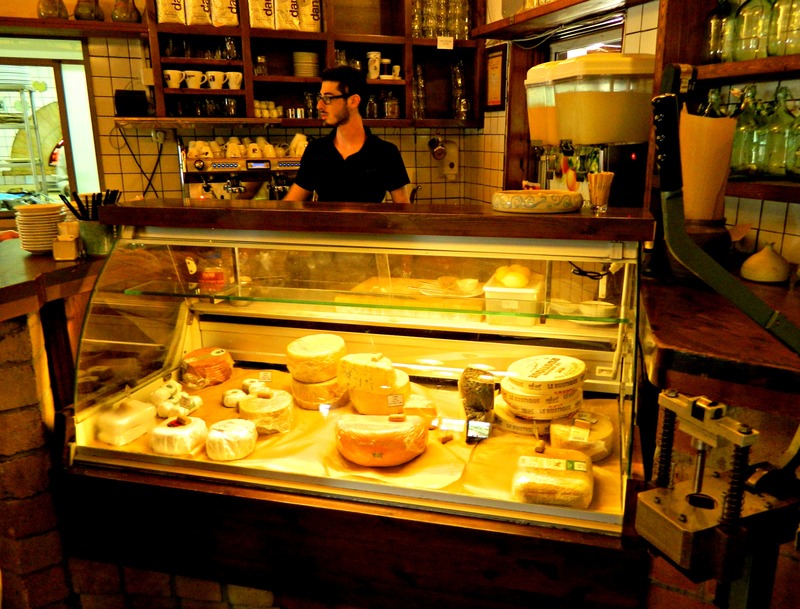 Suddenly my father decided that he’d rather get hummus at the famous Hummus Eliyahu in nearby Yokneam. 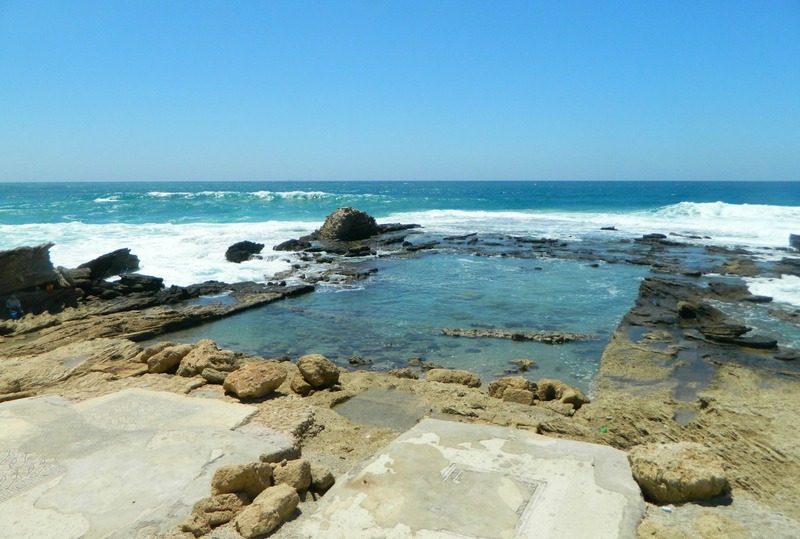 So, with our minds freshly stuffed with fascinating information and our legs slightly sore from all the walking, we left Zichron Ya’akov the way we came. There is still so much to be seen, so there will definitely be a sequel, but there is only so much that can be done in one day. That’s all for now. 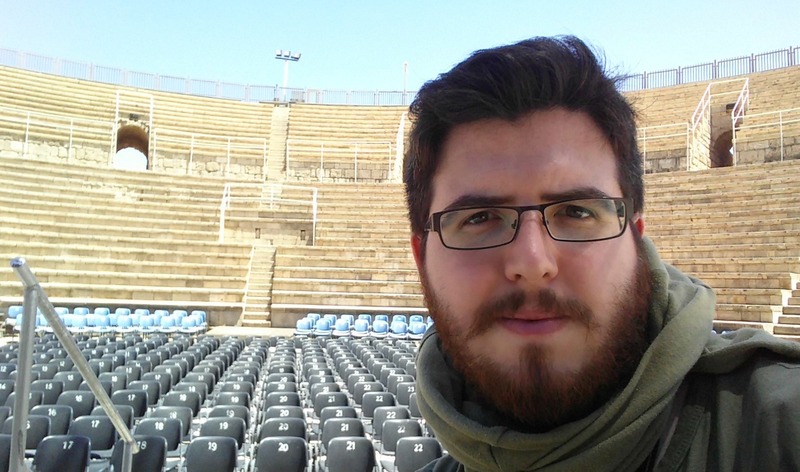 This past Sunday I had to attend a little meeting at my home base just south of Haifa and then I had the day off. My father drove me down and we planned a series of little trips for the day – but we ended up going places altogether unplanned. 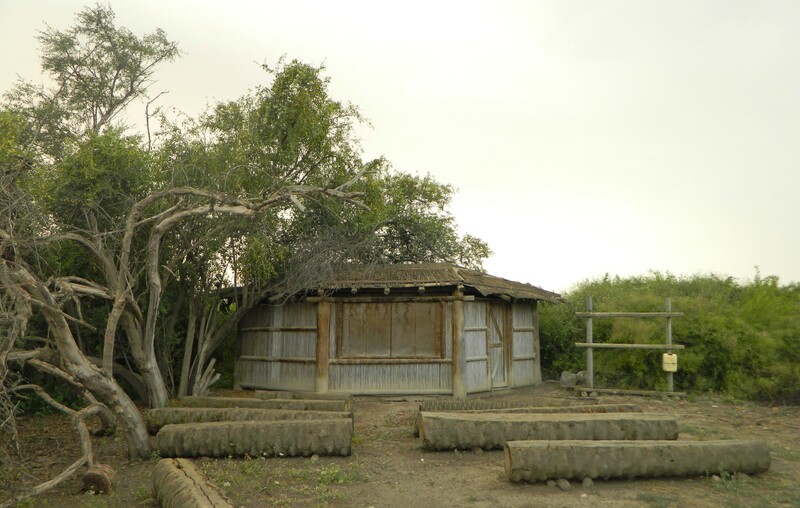 Our first stop was the Mizgaga Museum in Kibbutz Nahsholim between Atlit and Caesarea. 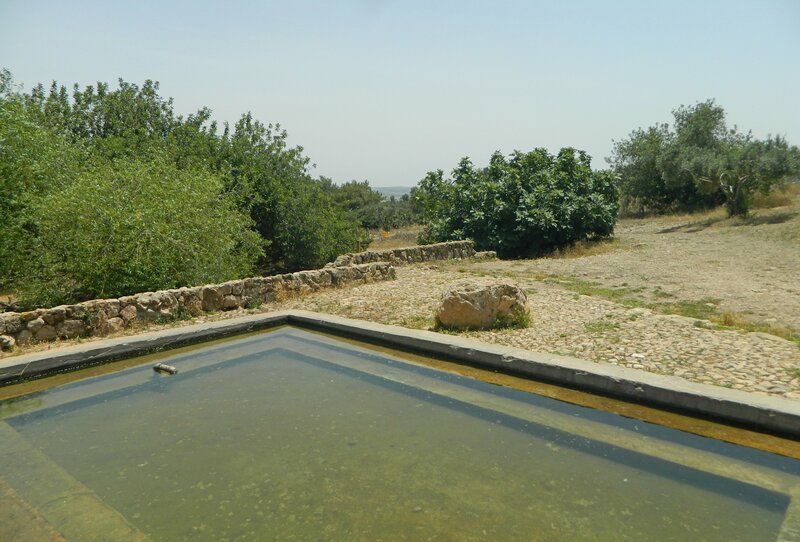 I had already been to neighbouring Tel Dor but didn’t visit the distinct “glasshouse “museum, despite seeing it, simply because I didn’t know it was a museum. This time I was better prepared. 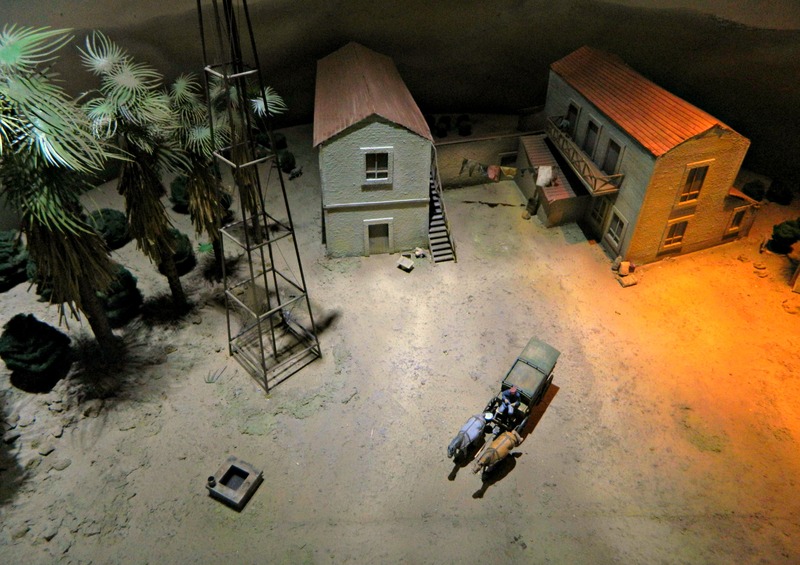 The Mizgaga Museum is located in the old bottle-making factory built by Baron Rothschild in 1891 to supply the fledgling wine business started in nearby Zichron Ya’akov and Rishon L’Tzion. 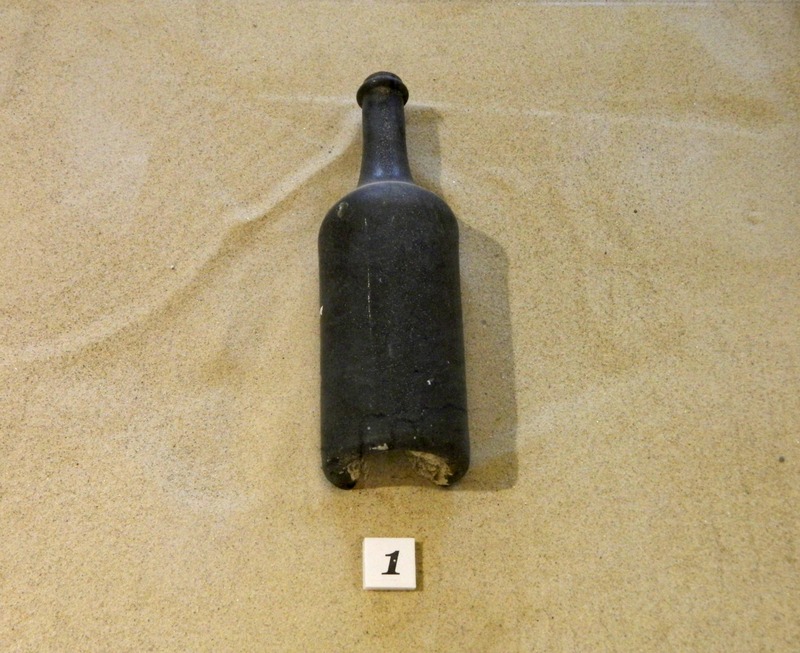 With a handful of Jewish workers, a French glass specialist and Meir Dizengoff (Tel Aviv‘s first mayor) as manager, the factory set out to produce glass bottles made from the sand just metres away at Dor’s beach. 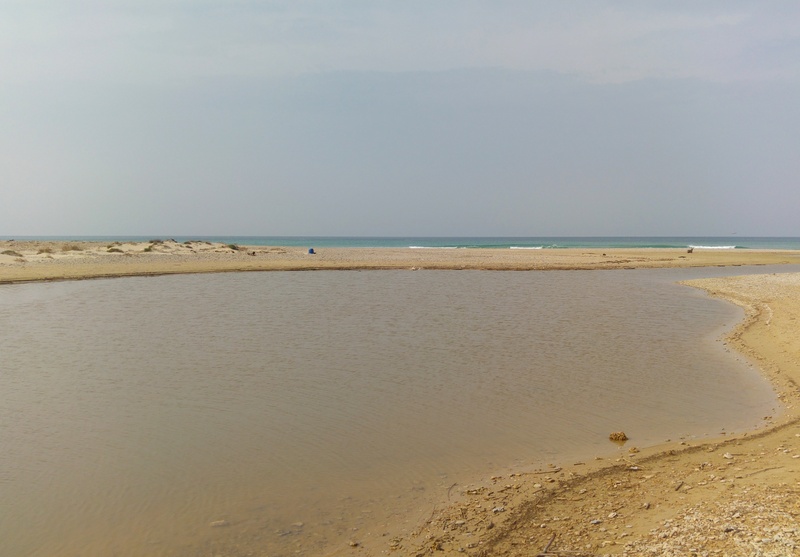 Due to several complications, the largest being technical difficulties which was attributed to this particular sand not producing a clear enough glass, the factory was shut down and abandoned in 1895. 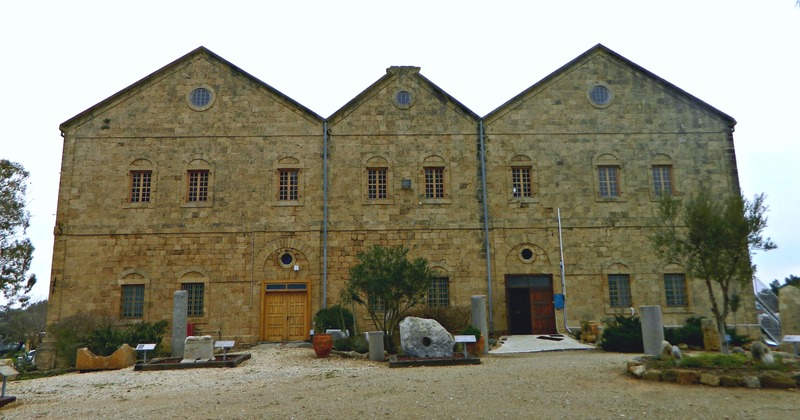 Baron Rothschild had sunk some 50,000 francs into this factory not only in building costs (which included imported French roof tiles), but also payments to the Ottoman Empire officials and to the local sheikhs of Tantura as well as the hiring of guards and a salary for the boat captain to transport the finished bottles once filled with wine. But his money did not go completely to waste. 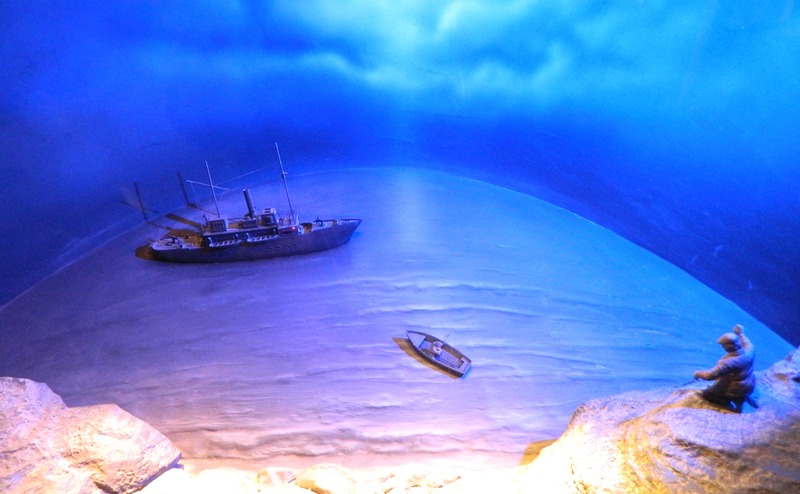 The abandoned factory was fixed up and turned into a museum as it is today, showcasing the history of the factory, glassworks in general and a nice collection of historical artefacts found in the area – both on land and at sea. Parking just outside at a resort, we walked through the small garden to the museum entrance, pausing to examine various stone anchors, a Roman milestone marker and a sarcophagus outside. Once inside, we were led to a video about the museum and about the Baron’s dreams of creating a prosperous land for his Jewish brethren. In that very room is the sole remaining (verified) glass bottle produced by the factory which was found in wastewater not far away. 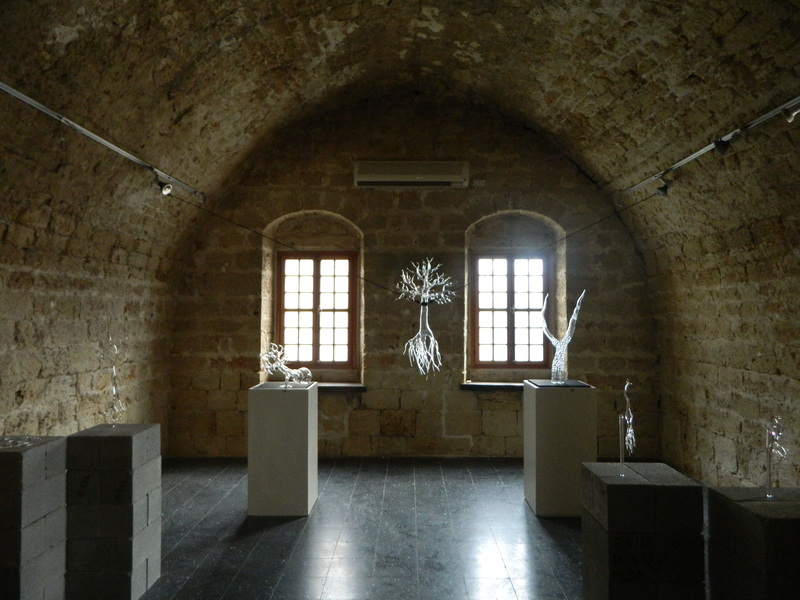 Due to the theme being glass, a brief history of glass and glassblowing was exhibited – I learned that glass was only mentioned once in the Bible (Job 28:17) due to its rarity and value. As we left the impressive stone vaulted rooms dealing with glass, we entered the realm of history – we started with “Napoleon at Dor”. 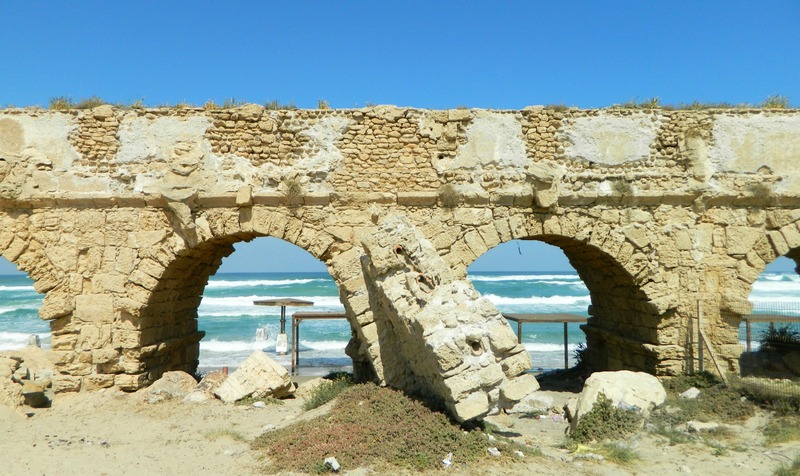 To briefly summarise the local history, Dor (now Tel Dor) was for a long time a very important coastal city until the need for deeper ports made the city defunct. 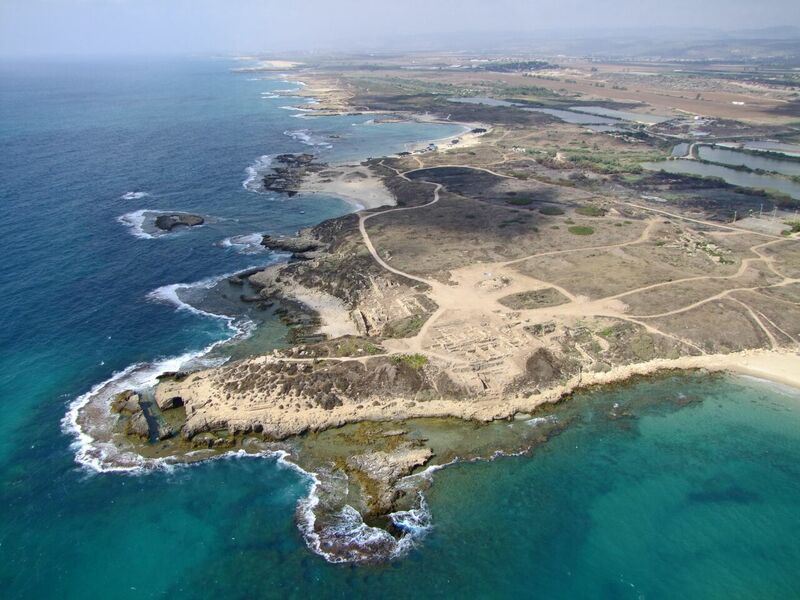 The nearby port cities of Atlit and Caesarea, with their better natural harbors, became more important and eventually Dor was abandoned. 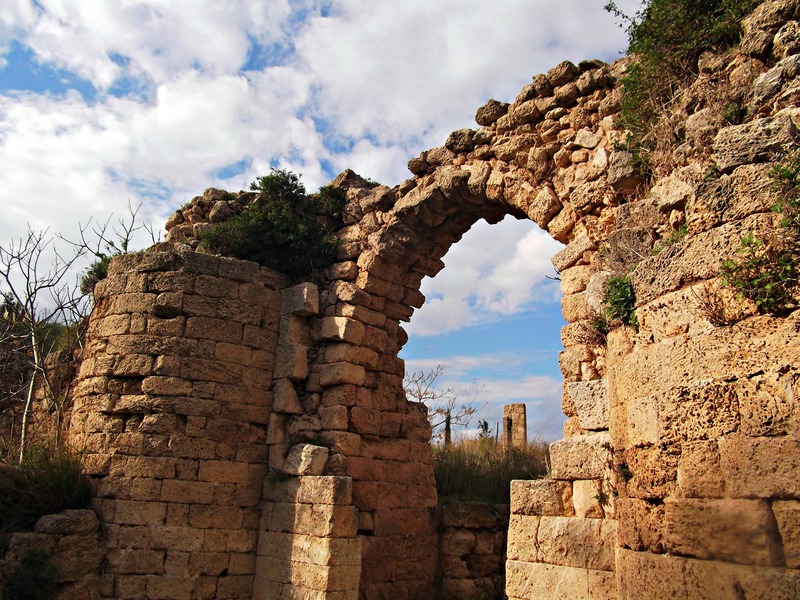 With a rich history of Canaanites, Greeks, Romans, Sidonians and later Crusaders, the ancient city of Dor experienced many centuries of quiet until 1799 when Napoleon made camp there. 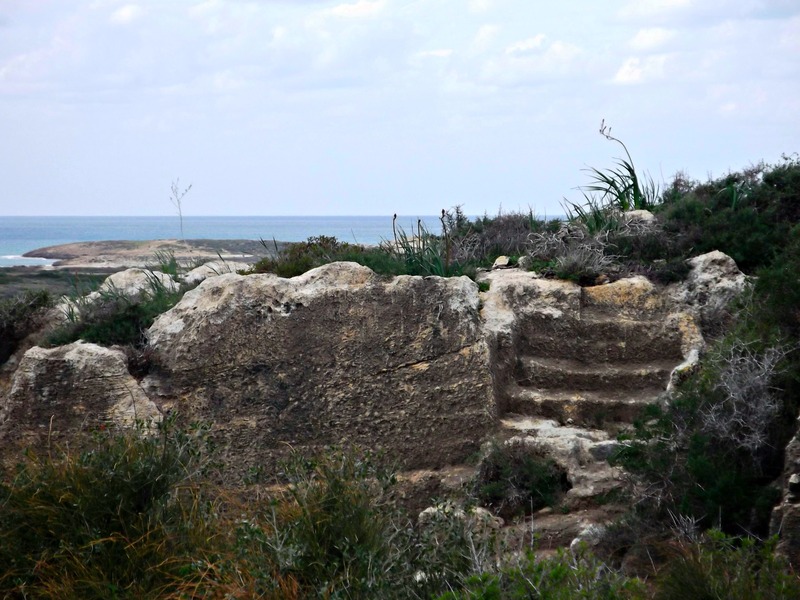 Local Arabs had created a fishing village just south of the ruins of Dor, under the name Tantura (which is believed to be an Arabic corruption of the Greek Dora), and they appeared sympathetic to the French army. Having battled his way up the coast from Egypt and conquering Gaza, Jaffa and Haifa, Napoleon reached failure at Akko after an ineffective siege of the strongly fortified coastal city held by the Turks and resupplied by the British. Fleeing south with his army, Napoleon made his final camp at Dor/Tantura before ditching cannons and muskets into the sea to lighten his army’s load on their final stretch back to Egypt. 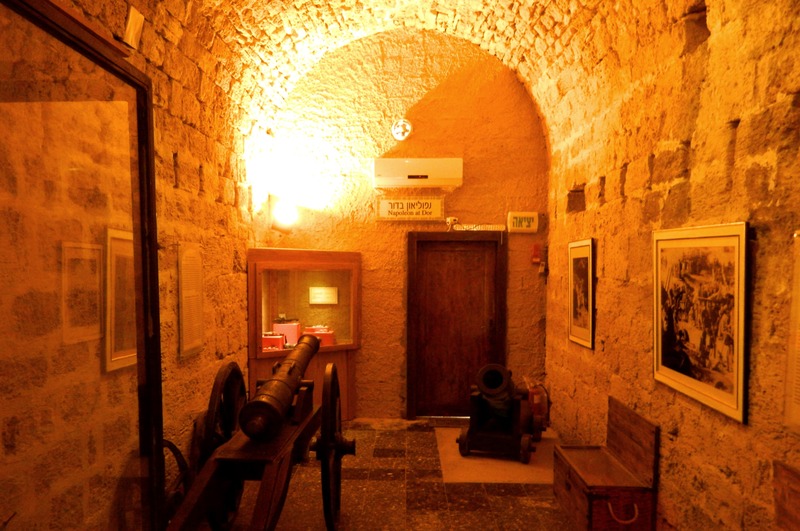 In the room dedicated to Dor’s Napoleonic period, there is a cannon, a mortar and light weaponry on display. The cannon was Turkish in origin, captured at Jaffa and the mortar was Spanish, made in Seville in 1793 from Peruvian copper, captured from one of the wars with Spain. The next room we visited was “Christian Dor”, largely focusing on Dor’s Crusader period. 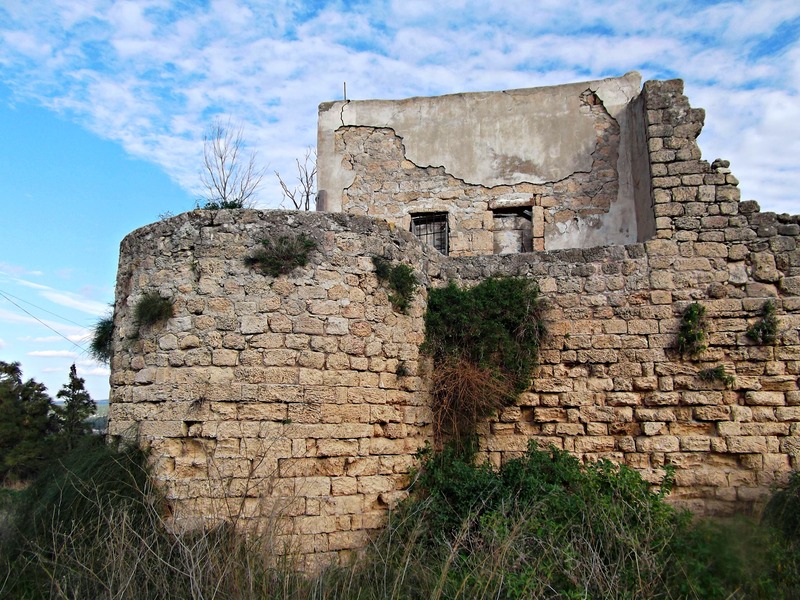 Home to the Merle Castle, belonging at first to the noble French De Merle family, Dor was one of many Crusader strongholds along the coast. 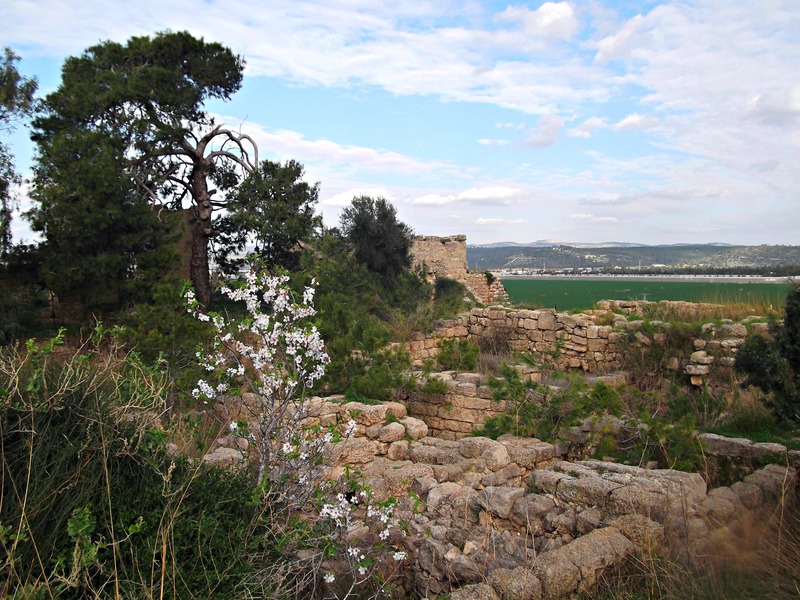 In the late 1100s, the castle was handed over to the Templar Knights after being briefly captured by Saladin and his army. 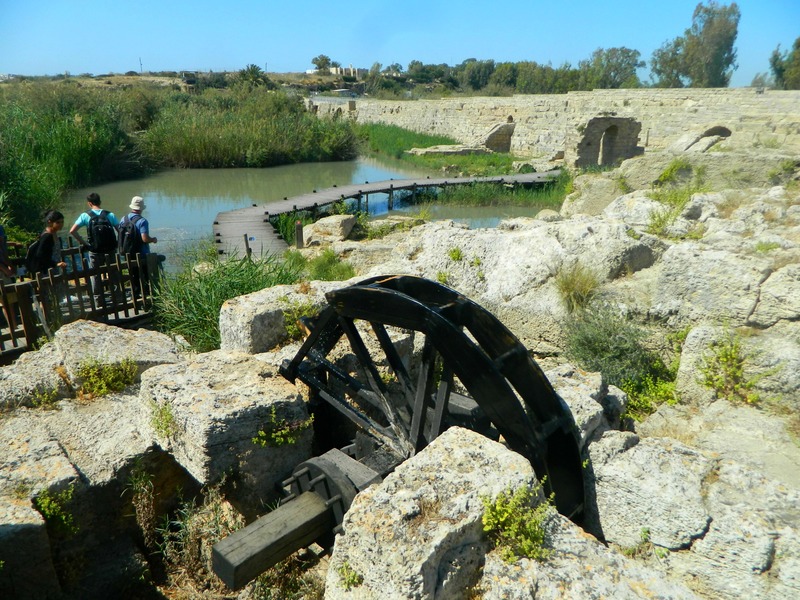 Although there is no record of it, it’s assumed that the Crusaders evacuated Merle around the same time they evacuated Atlit, the last Frankish capital in the Holy Land. 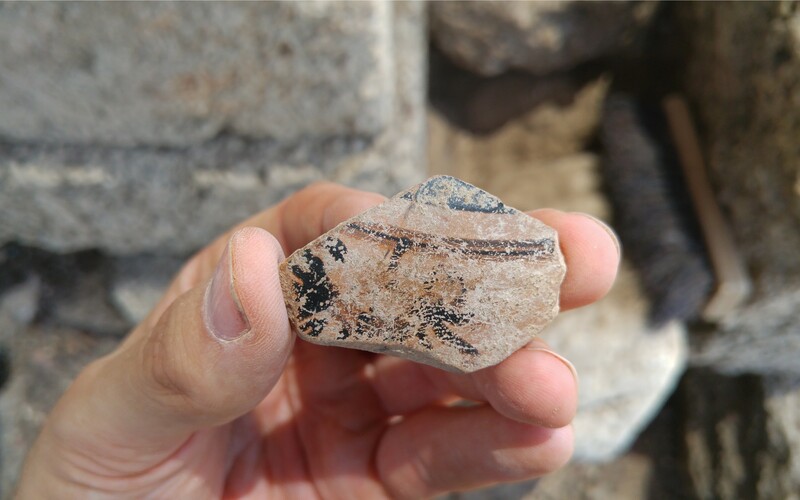 While Merle Castle has been reduced to a few broken stones, many artefacts from the Christian periods have been found including part of an ivory sceptre once belonging to a bishop, knights’ swords and more. The next room was about underwater excavations and salvages, showcasing a dive operation in 1982 of a Byzantine shipwreck. With a video of underwater footage and some of the finds displayed in the room, it made this field of expertise quite fun looking. 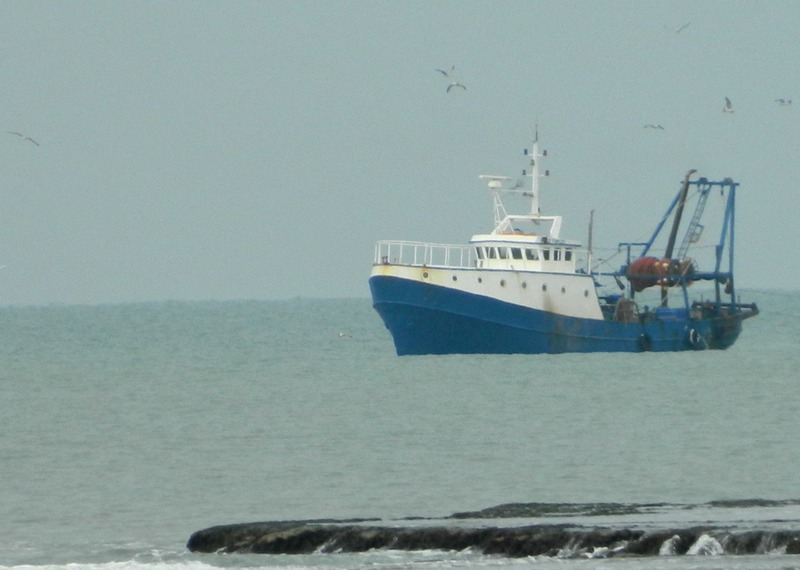 Being that this wooden ship was a mere 3.5 metres offshore and at only 2.5 metres deep, I wonder how many more similar shipwrecks there are to be found. 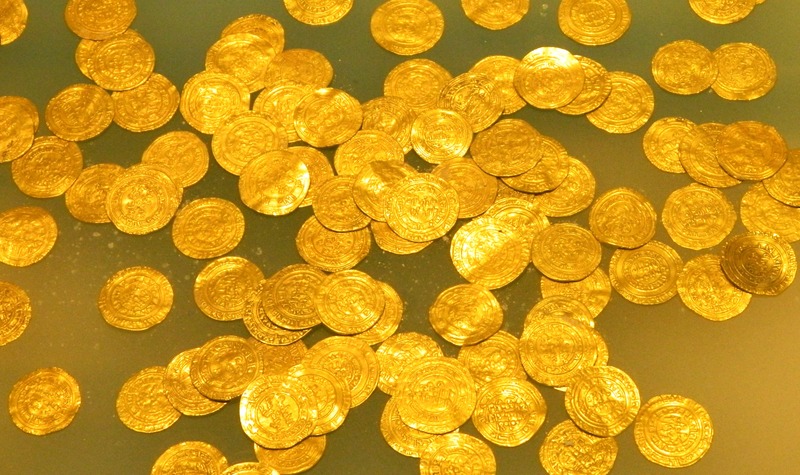 I just saw in the news that the largest hoard of gold coins discovered in Israel was just found underwater near Caesarea – sign me up! 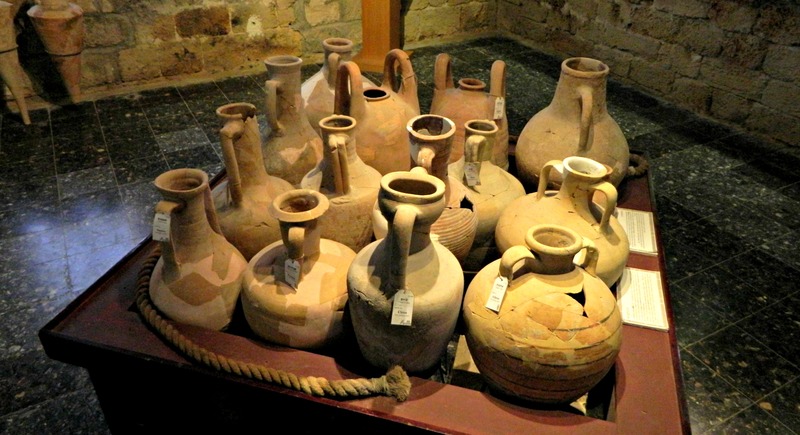 Continuing on with the museum exhibitions, we came upon a room of excavated artefacts including a collection of clay vessels from a variety of locations: Chios, Athens, Kos, Cyprus and more. What we saw next came to me as a bit of a surprise… a room dedicated to the famous Biblical colour of “techelet” – a specific shade of blue. Although there are Jews nowadays who wear “techelet” in their “tzitzit”, the secret production process was lost generations ago and the ancient colouring disappeared from the world markets. Today it is generally agreed upon that the colour comes from the Murex trunculus snail, which produces a clear secretion with the addition of oxygen turns purple-red which can then be turned blue with sun exposure. 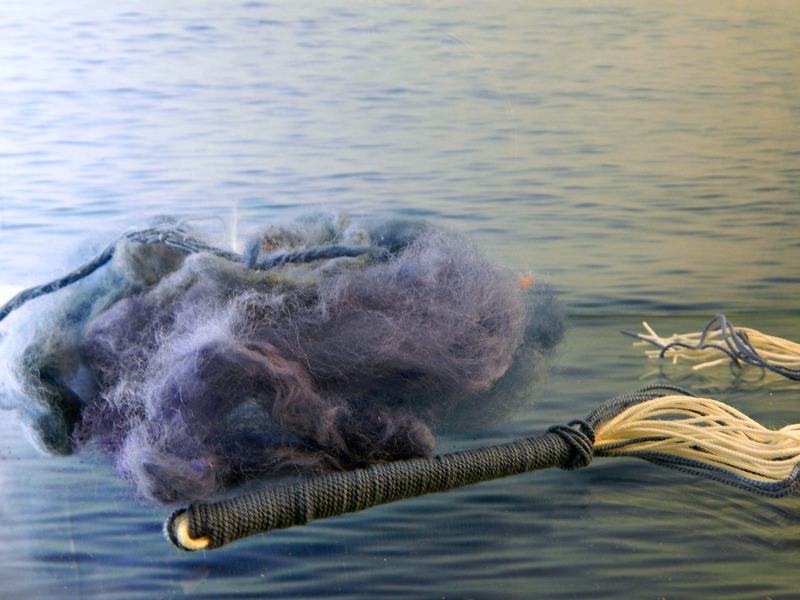 I’ve also read that wool that has been treated with an alkaline substance can be dyed blue with the chemical bonding of the snail secretion and additional oxygenation. 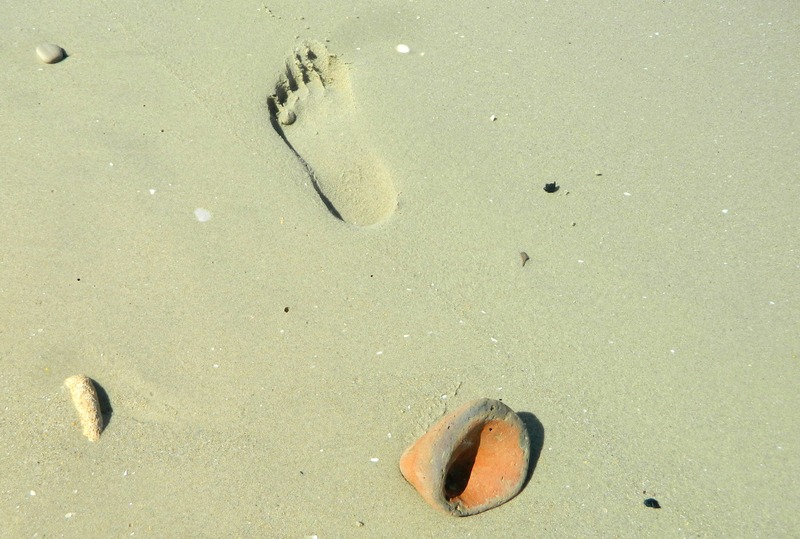 I’m sure that the workshops held there at the museum can shed further light on this most interesting topic, especially as the sea snail can be found just offshore. Heading out of the museum, we took a minute to peer up at the expansive factory’s untouched upper floor where the furnaces for glass-making were held. 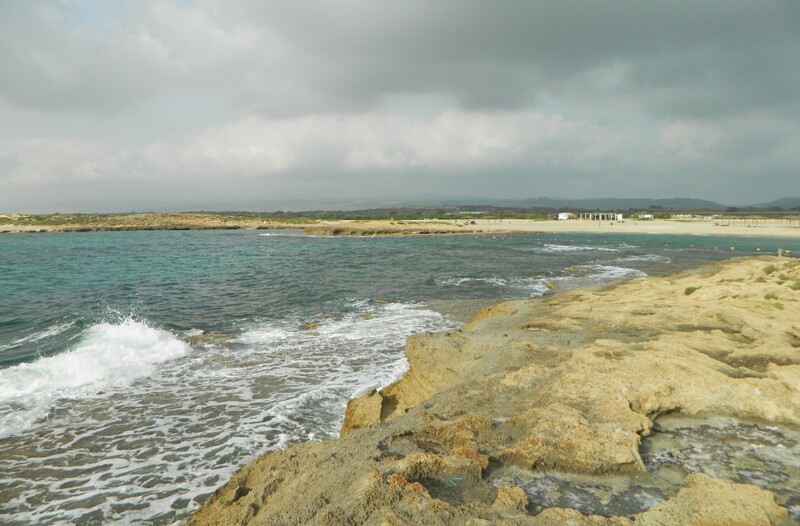 Just behind the building is an ancient burial cave, and, after seeing it, my father suggested we head over to the beach. 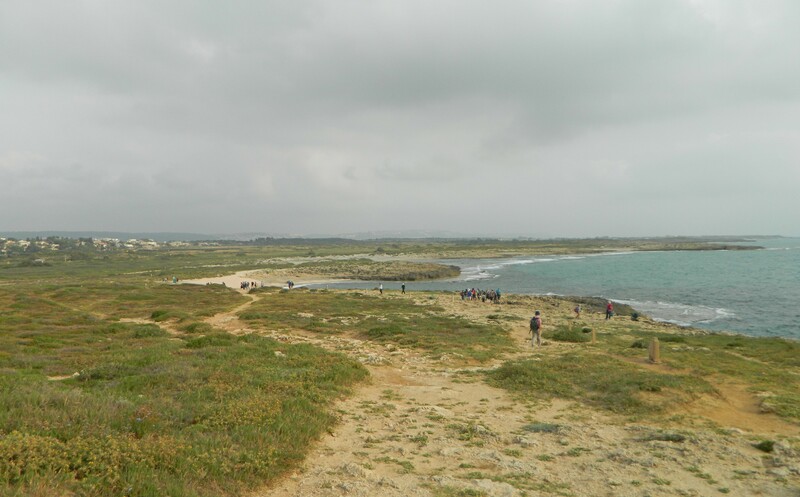 With overcast weather nearly identical to the day I first visited Tel Dor, I was disappointed from a photographic aspect. We walked along low tide’s lapping waves, looking down at the shells and sea glass that had washed ashore. 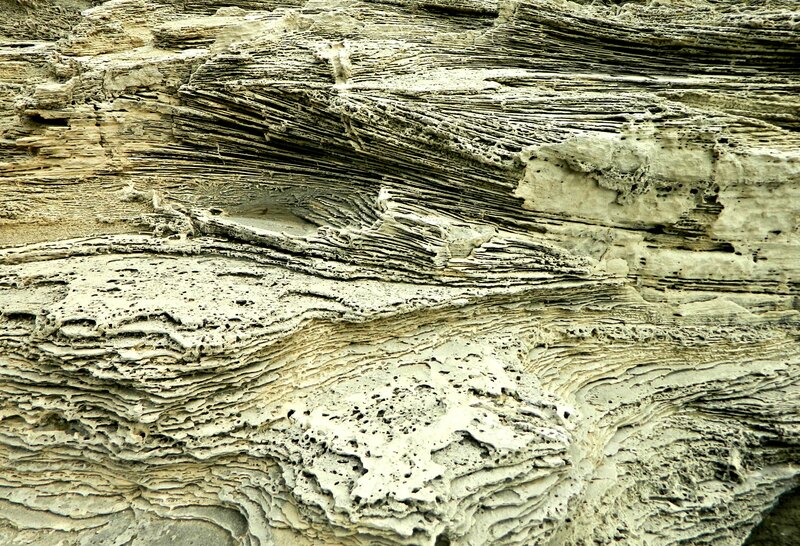 We climbed up on a rough outcropping and marveled at the unique physical makeup of the reef-like rock. We looked around at the small fishing boats and the small islands, which are actually a protected “park” area, and then noticed an old arched structure further along the beach heading south. 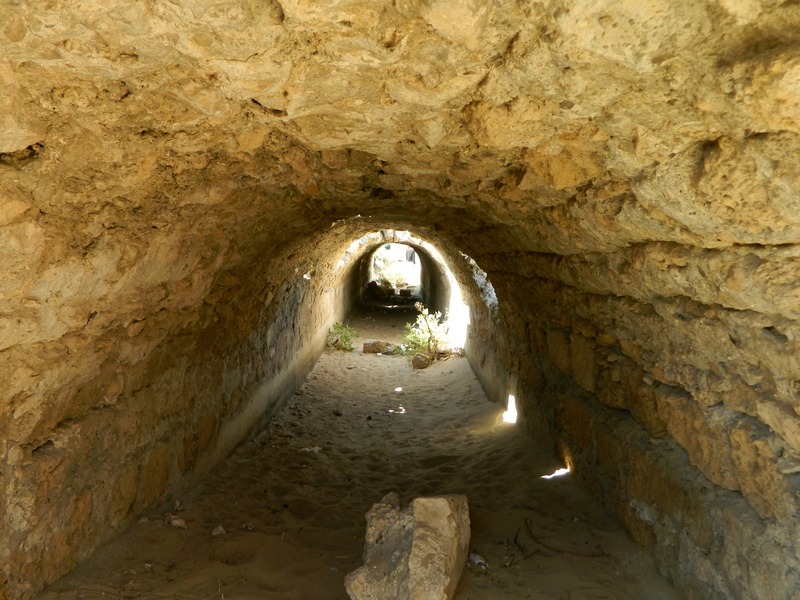 What we found was the remains of the Arab khan (caravanserai) for travelers built several hundred years ago. With that we headed back to the car, leaving behind the modern Dor and Nahsholim with their Greek and Turkish Jewish immigrants and their industries of banana, avocado, cotton and fish farming. 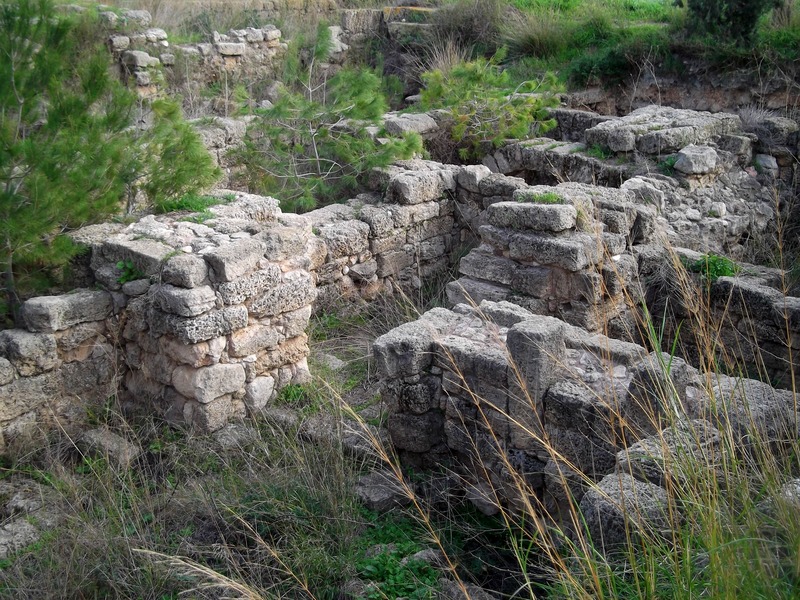 We were headed for Zichron Ya’akov, founded by the very same Baron Rothschild who built the Mizgaga. A few weeks back I went on a private wine tour, visiting four different wineries, with my friends Joel and Les from Australia. Taking an early morning train, I met up with them in Tel Aviv and we started the day with coffee and breakfast at the hotel. 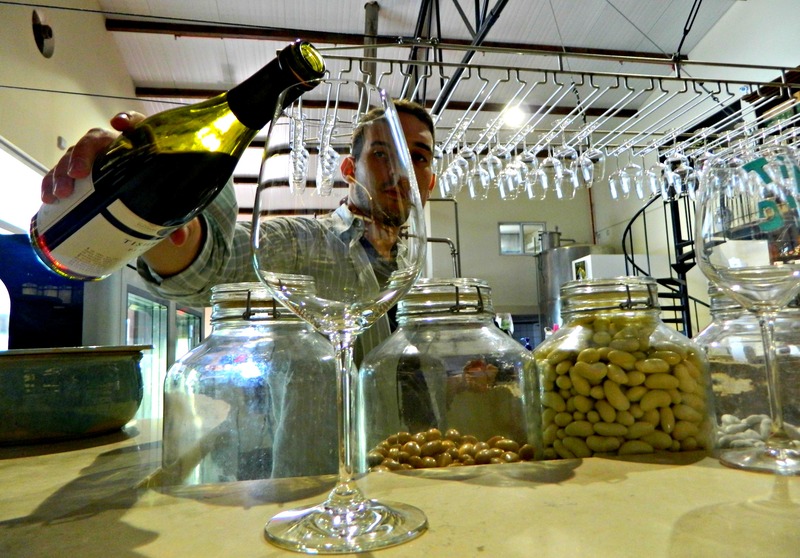 After being picked up from the hotel by our tour guide Yakov Feder from Israel Wine Journeys, our first stop was the Tishbi Winery located between Zichron Yaakov and Binyamina just south of the Mount Carmel. 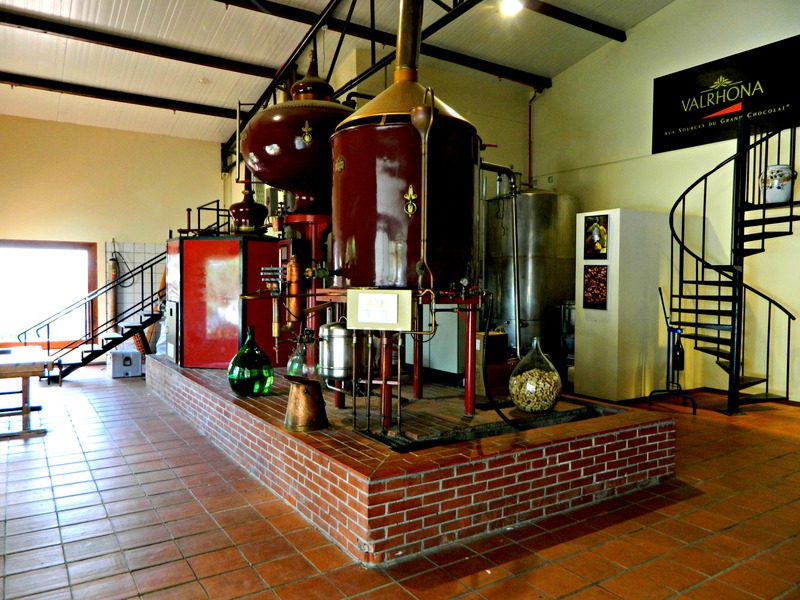 The Tishbi Winery is the largest and most commercialised of the four wineries we toured – the sixth largest in the country – and their history is by far the richest. 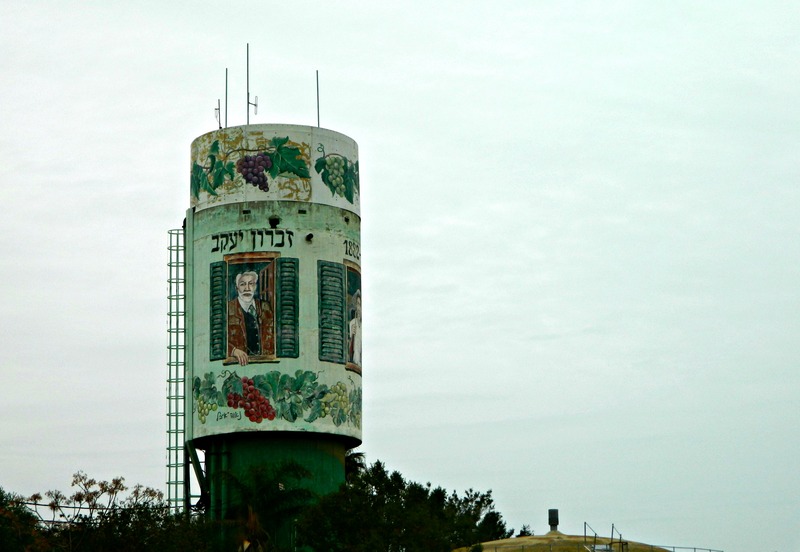 With the founding family’s move in 1882 from Lithuania to Zichron Yaakov, the family patriarch Michael was commissioned by the Baron Rothschild to produce wine. Fast-forward to 2014 and the Tishbi family is still hands-on in the wine industry, running their Tishbi Winery since it opened in 1984. 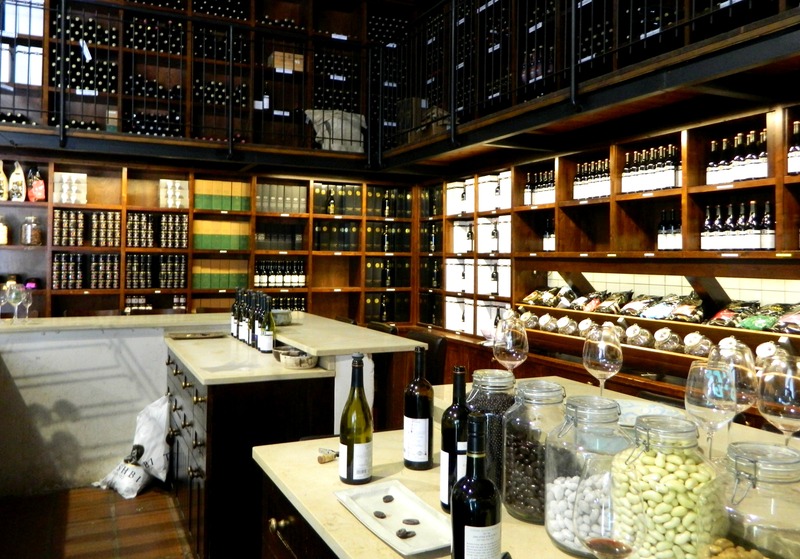 We entered the winery’s visitor centre and sat down at the bar, our tour guide arranging the wine and chocolate tasting tour for us. Omer was our server and he prepared six Valrhona chocolates to compliment the six red wines we’d be tasting. First we opened up with the Pinot Noir and the Organic Syrah, trying dark chocolate samples with each glass. Next we had the Merlot and the Ruby Cabernet, one of these came with an interesting chocolate from Madagascar. In retrospect, if I remember correctly, the chocolates went from west to east as we tried them (from South America to Oceania). Up next was the Ruby Cabernet and then, finishing with the Estate collection, my favourite, the Barbera Zinfandel. Tishbi’s version of port, this wine was sweet with a fortification of brandy, bringing the alcohol up to 18%. Aged in oak barrels for 18 months, this particular vintage was 2006 – the oldest wine of the tour, I believe. A little about the Valrhona chocolates we tasted, the original Chocolaterie du Vivarais was opened in 1922 in France and to this day, imports cocoa beans from the world over to produce its chocolates. Similar to Valrhona but on a smaller scale, Tishbi uses grapes from all over Israel to make their wines – from the Negev to the Golan. 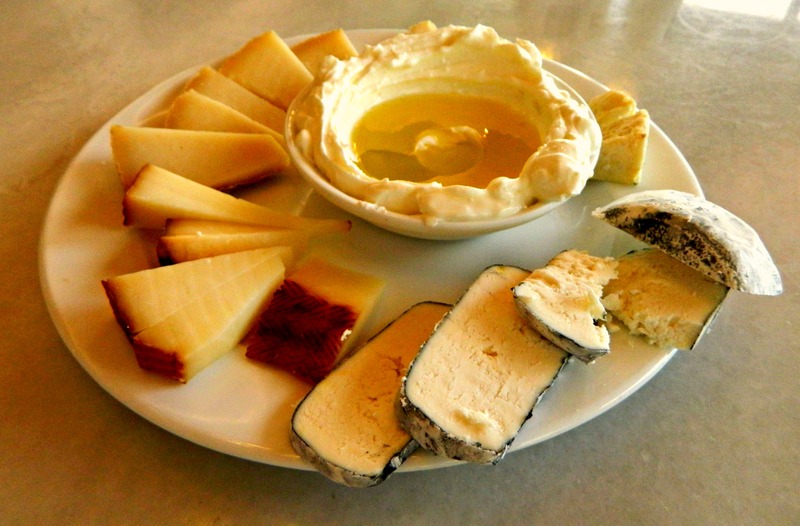 When we finished our six chocolates and six wines, I tried a white chocolate and then we headed over to the adjacent winery restaurant for a gourmet cheese platter. 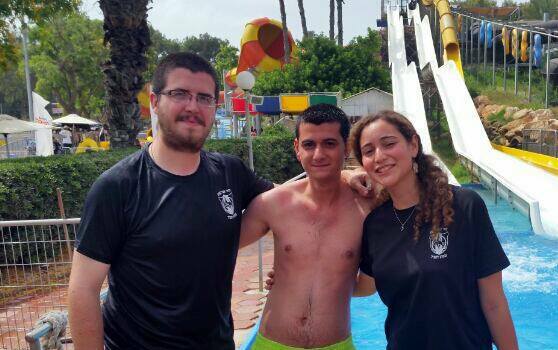 Back in June, the day after Shavuot our entire battalion went on a little trip, visiting two places: Mount Carmel and the Shefayim waterpark. Loading up on buses in the morning, we drove up the mountain not far from the base and parked at the first site, the memorial for the Carmel Fire – the enormous forest fire in 2010 that claimed 44 lives. 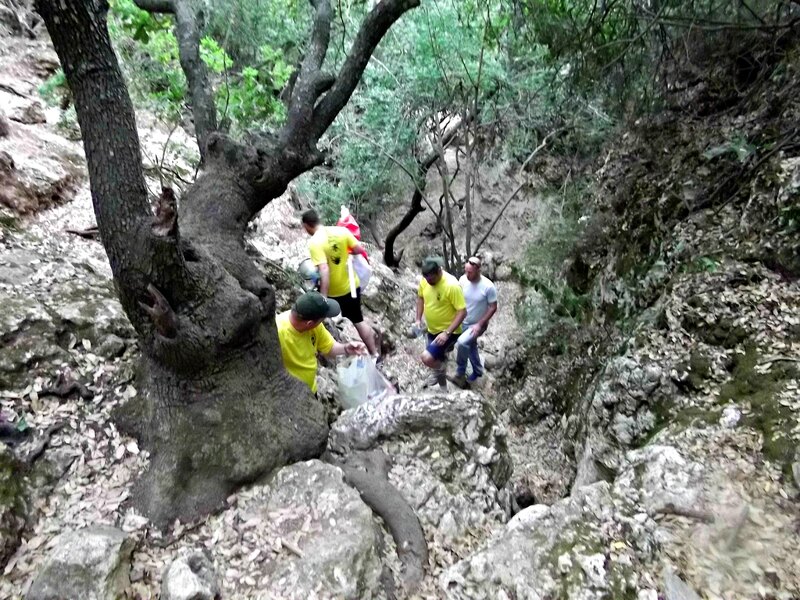 We all gathered at the memorial and the battalion commanders spoke, outlining the plan of the day and informing us that several SPNI guides were to be taking the Mount Carmel hike with us (SPNI – Society for the Protection of Nature in Israel). 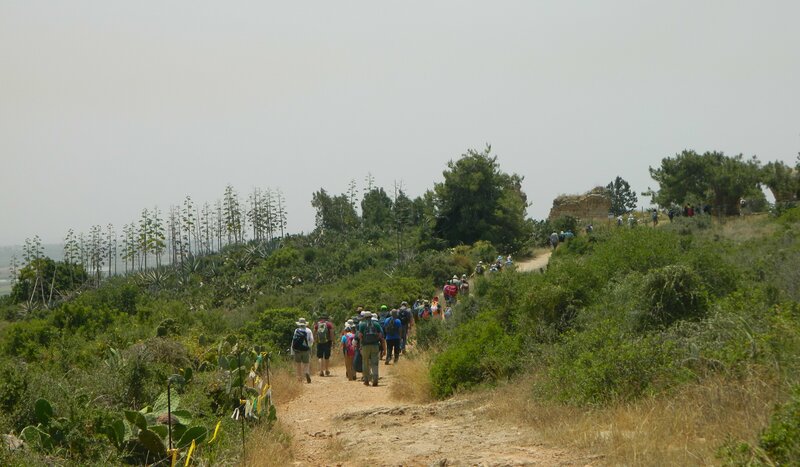 After respecting the dead and photographing the memorial site, we head out on our mountainous hike – each company starting a few minutes after the previous one. 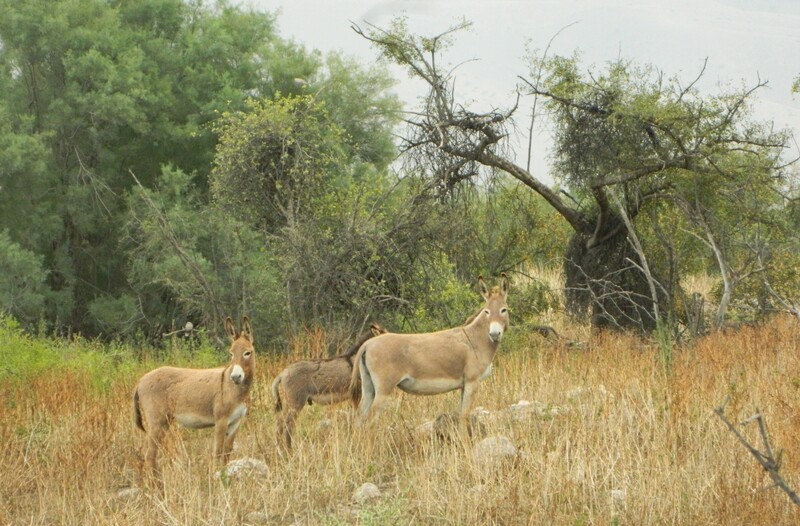 Not much of a herd follower, I meandered around and took my time, the groups passing me by. What I had imagined would be a simple, rather symbolic, hike was actually a legitimate mountain hike with craggy footholds and sheer cliff edges. One thing that I found interesting was the fact that many of the blackened trees stand exactly as they had several years back. We walked and walked, and then I came upon one of the SPNI guides giving some background on the region’s fauna. When that came to end, I hurried on ahead and climbed the trail’s rocky path, passing too many littered water bottles. Eventually, with the howling masses at my heels, I finished the hike sweaty and invigorated. I enjoyed a quick snack and then ditched my M16 with the special vehicle and crew tasked with the job. Sitting beside a friend, we set off for our next destination, the Shefayim Waterpark. As this was my first waterpark, I was excited to have the new experience but rather apprehensive at having the experience with an entire battalion. Within an hour we pulled up at the waterpark, just north of Herzaliya, and we disembarked. Slipping into something a little more comfortable, we had lunch and then headed for the water. With so many choices, but so many lines, I first plunged into the main swimming pool. Then a different pool, and then an interesting tube ride. It was on that tube ride that we capsised at the end and lost track of our other friend. 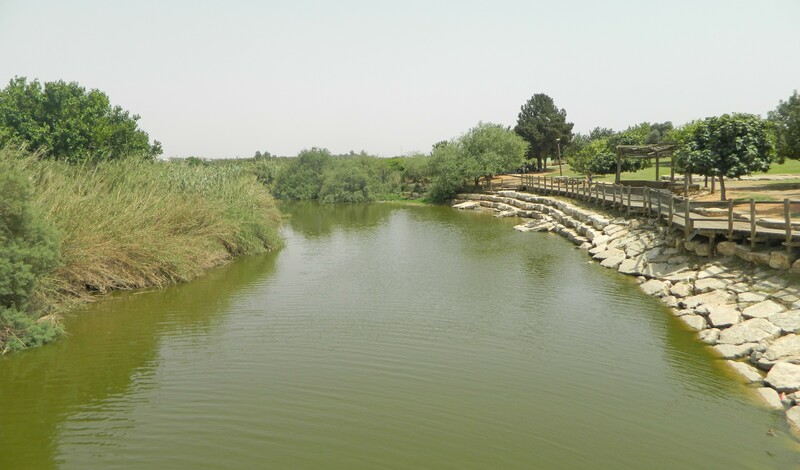 Waterparks being waterparks, I don’t know what more to say – rumour is that the army is taking us to yet another waterpark, thanking us for our hard work during Operation Protective Edge.